The arrival of Mon Way Bistro on Mill Lane seems to have caused a bit of a stir (especially the soups! ), and somehow captured the imagination of a broad range of diners. It’s often very busy, sometimes with customers having to wait to get a table, and inside it’s relaxed yet buzzing, with diners really enjoying themselves. 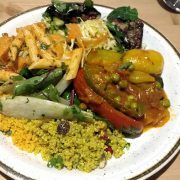 Specialising in vegetarian, and often completely vegan food, and presented via an ‘all you can eat’ buffet (something that always appeals to me! 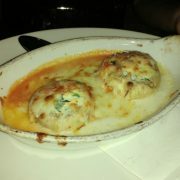 ), I was curious to see whether the eating experience would live up to their tantalising photos on Twitter and Facebook. Chatting with owner Andrea and one of her chefs, Mihaela, it became apparent very quickly that this is an operation run with real enthusiasm and commitment. The food is excellent. 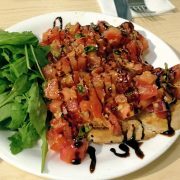 Enticing salads, reminiscent of those at the charming Clock Café on West End Lane (previously Lena II), with key items such as aubergine; pasta dishes, grains (yes, this is NW6, there’s quinoa! ), couscous with raisins etc. – there’s plenty of choice, and everything is prepared with care, vegetables cooked well, sauces and dressings well-seasoned. I ate ton of food, then promptly marched back to the buffet for seconds. Now desserts must be tricky to do from a vegan perspective; without eggs they can be a little dense, however I actually quite like this quality, and the unctuous feel it gives to brownies and things. 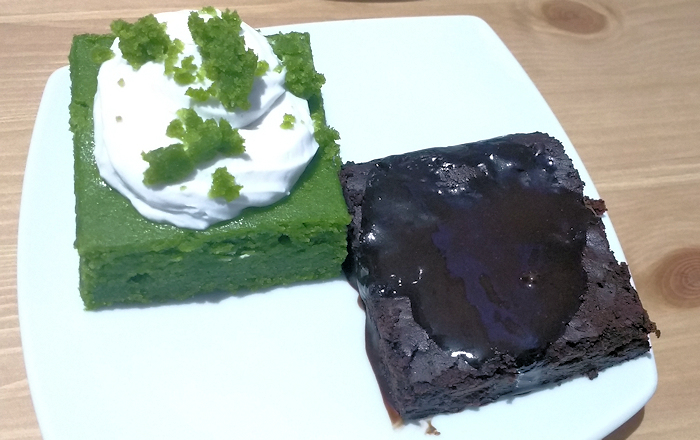 Indeed, brownies were present, and delicious, but I was also intrigued by emerald cakes (or whatever they were called) which feature spinach. These were delightful, and very moreish, I think due to being well-balanced with not too much sugar. This style of food is becoming more and more popular. It only takes a quick Google to learn of all sorts of people endorsing it – including professional rugby players, who clearly need a pretty solid helping of protein and nutrients. For me, it’s grub of which you can enjoy generous quantities, and still feel great afterwards. Fantastic after a workout, or just as a healthy alternative for any occasion. And that feeling of healthy empowerment then makes it all the more justifiable to enjoy a huge curry and a bottle or two of red wine in the evening (not that those are unhealthy, of course). Dry January? F**k that. But eating at Mon Way every day for a month? – I could do that, happily. 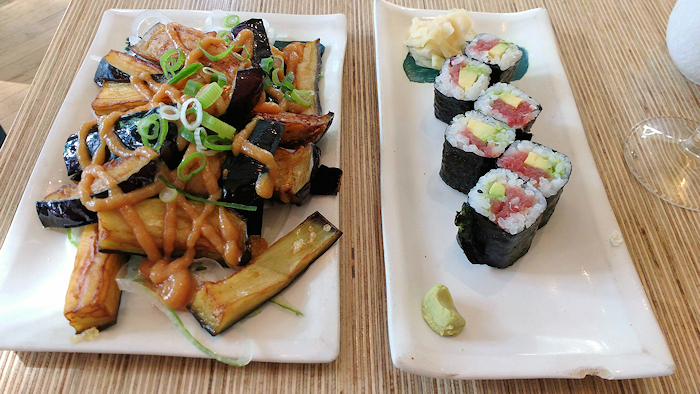 Ed – Mon Way is now offering the vegan buffet during the week as well as at weekends. It was £6, and will be rising to £9 (still very reasonable). 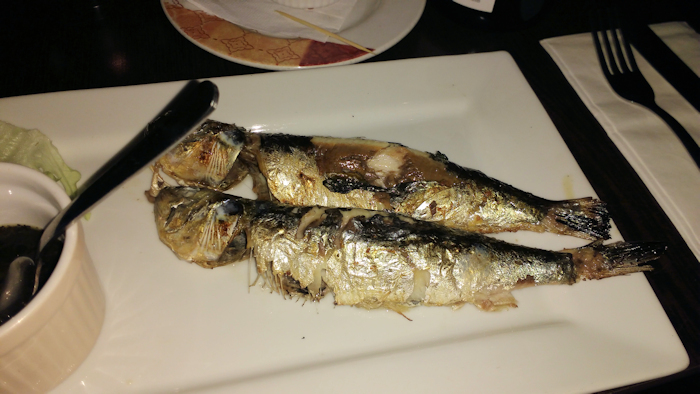 To start, chargrilled sardines, which I could happily eat as a main, in large quantities; these were a pleasure to devour. 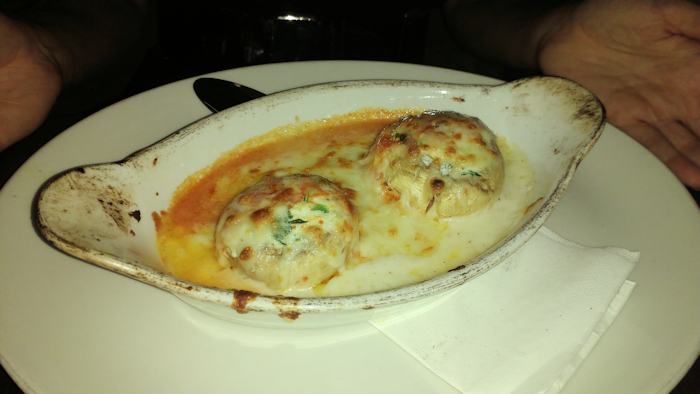 A little baked mushroom dish also appeared, the mushrooms filled with ricotta and spinach, with a cream sauce – quite rich for a first course, and satisfying. Nothing high-brow, but piping hot and well seasoned. For a main course, as I was dining with a vegetarian, I decided I’d join in the fun (?) and try something veggie myself. 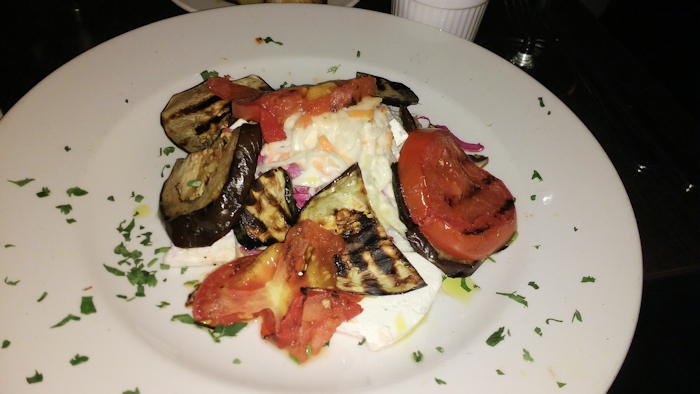 This wasn’t too difficult a decision once I noticed a salad of chargrilled aubergines and roasted tomatoes with feta. The dish worked well because the salad element featured plenty of coleslaw, which added substance and a crunch factor. The aubergines were perhaps a little firm (also noted in the risotto) but I guess that was due to grilling rather than frying. 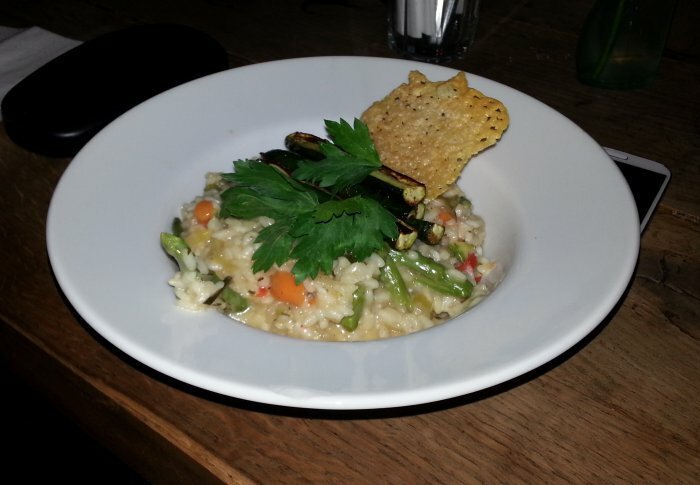 Across the table, risotto alla caponata (more aubergine, garlic, feta and tomato sauce) was also enthusiastically received, and sides of sautéed potatoes and ciabatta (oddly spelled incorrectly on the bill!) provided further carb relief. Nona’s menu is appetising, with a great deal of variety even down to the side dishes, which causes chaos for greedy types like me who generally want to eat everything. In both choice, and value, it’s along similar lines to the equally appealing and ever-popular Little Bay (side note: extremely sad to see the Farringdon branch of LB closed). For inexplicable reasons, we didn’t drink Italian wines, instead opting for a French Pinot Noir at £25 then a Rioja at £5.85 a glass; both enjoyable, the latter the better one. 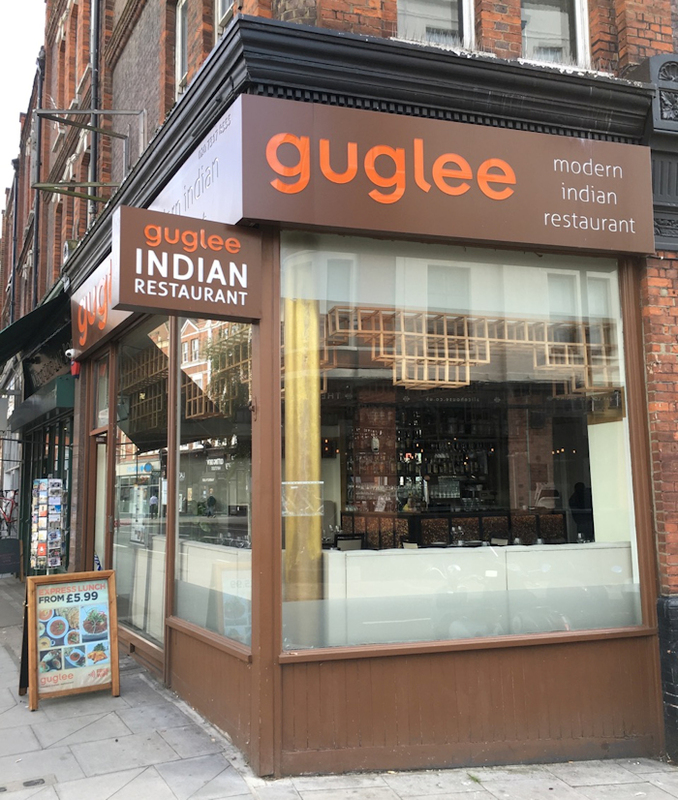 This is a fun, upbeat restaurant serving gratifying plates of straightforward food at very fair prices, perhaps meaning one can pop back into The Arches afterwards and browse its wine list. Or, as we did, finish up with a drink directly outside Nona, in this very likeable, leafy little location. 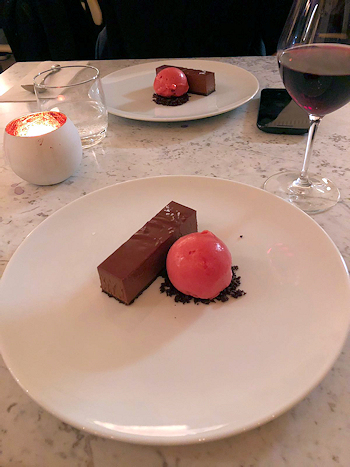 No room for puds on this occasion, but the website sagely advises that “saving room for dessert is an extremely wise move” – so good reason to return soon. 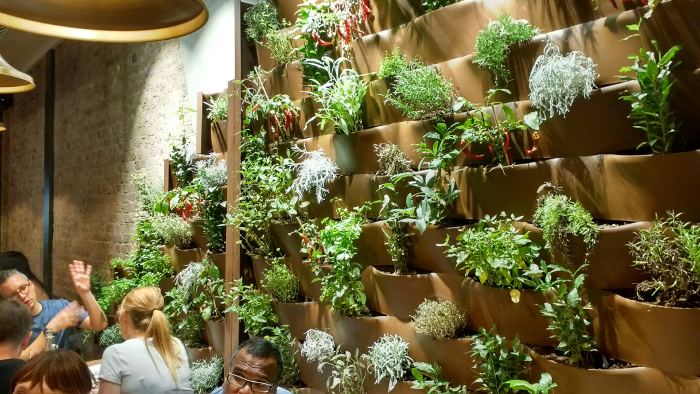 It’s cheery inside, smart but laid-back, with one wall housing a remarkable array of herbs and chilis, quite a sight, and wonderful to know they’re going straight into the dishes. Browsing the menu in advance I immediately got the impression these were ‘serious’ pizzas, as many appeared simple, without too many toppings, and no additional ones (though there were some less-standard choices available, and a special, a lemon-based one which sounded intriguing). My table quickly devoured a charcuterie board, and looking across the room I noted an elegantly presented salad indicating care and attention. This seemed to have what looked like crisps placed on top; Mark noted several comments on these, in some cases accompanied by quirky Italian terminologies for fried this or that, but I think we’re all in agreement that yes, those were crisps! 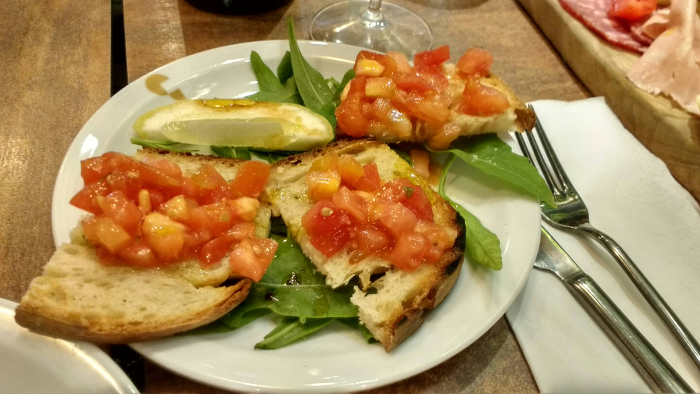 The bruschetta was good, as was the gnocchi (we tried some as a bonus starter) – somehow light yet rich, with a tantalising softness to it and just a little ‘edge’ as well. For both these dishes, I’d have liked a touch more salt, but then I’ve probably mashed my tastebuds due to decades of, well, getting mashed. 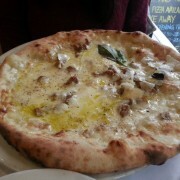 I selected the Puttanesca pizza. With simple pizzas there’s nowhere to hide, so there has to be seasoning and taste; and indeed this was delicious, with strong flavours and satisfying dough. For sure, it had a touch of class and confidence to it, which I think is is what we were hoping for with this type of venture. I was puzzled by all the toppings being in the centre (from the menu: Agerola fior di latte, slow food capers, and Caiazza black olives from Selanova), and although I admired the intention of these dark, intense olives being unpitted, this did inevitably mean it wasn’t easy to get a taste of everything in one bite. More puzzling was the omission of the stated Casa Marazzo organic tomatoes, especially as the whole menu sings-out “tomatoes!” throughout. The bonus addition of basil added a nice dimension though. Whatever, I’d happily have been back to try other options at 8am for breakfast given the opportunity. (Well perhaps 10am). Service, via the friendly but professional Luka, was efficient, and we enjoyed a chat with the effusive founder, Tony, who seemed to be an exact 50-50 Italian / English mix. 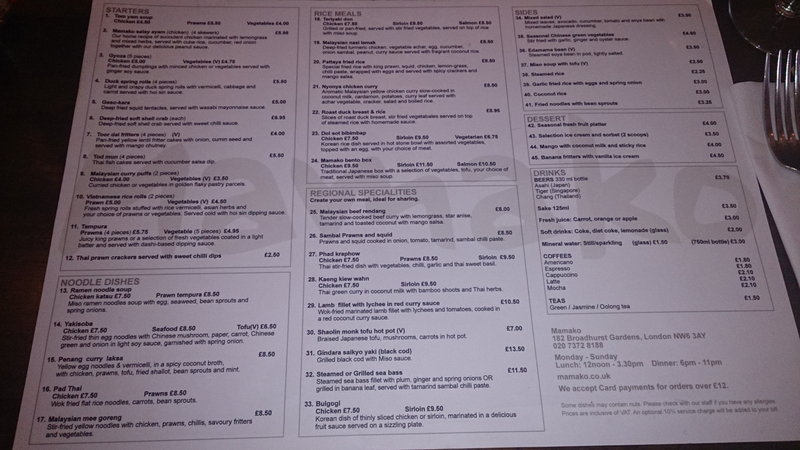 Us simpletons were amused and confused in equal measure initially, when Tony read menu options in vibrant Italian before sounding like a Kilburn pub landlord moments later. We tried two reds: Aglianico Quartieri 17 – “savoury, meaty notes and plum fruit characterise this dry house red” – indeed it was dry, quite a refreshing wine to start off with, then Piedirosso Pompeiano 20 – “a medium bodied red with hints of strawberry on the nose and strawberry & blackcurrant on the palette” – a similar lightness (12.5% ABV) but with rather more to it, to match up against the grub. A note about the chili oil – it was excellent. That sort of heat which creeps up, transpiring to be far more complex and indeed spicier than expected. Now, I tried to stitch-up poor old Goetz on my table, by assuming a nonchalant manner and suggesting “put tons of it on, it’s very mild” – however, as Goetz already knows I’m an idiot, he saw through my devious plan immediately – dismissing it with a chuckle and a bite of his calzone. Doh! High quality pizzas, then lounging about in The Black Lion a couple of doors down – sounds like a sensible Kilburn-based evening, does it not? Welcome, Quartieri – we look forward to next time. Strange things have been happening in the world of tomato ketchup. First, upon requesting some whilst enjoying a magnificent fish & chips in The Beehive, Crawford Street, the waitress apologised that they didn’t have any ketchup, “however we do have this…”, she said, before disappearing for a moment and returning with several sachets of sauce instead of a bottle. Absolutely fine, false alarm! Second, what is this nonsense whereby ketchup is suddenly on the sugar-police watch list? Facebook is annoying enough without that sort of rubbish. As if you sit there drinking three bottles of the stuff, for goodness’ sake? Anyway… musing these condiment-related anomalies, I dived into One Bourbon for a spot of lunch after challenging myself as to whether salmon tacos could possibly be any good? The idea sounded odd, but given there were a couple of side dishes I liked the sound of, I steeled myself and took up residence near the window with a reassuring wine list. I was curious as to how slabs of salmon and crunchy cabbage would work, however the former was scrambled into morsels and the latter pickled and shredded; things were starting to make sense. Watercress was present, but a little more of the coriander and onion would have boosted the salsa’s flavour. 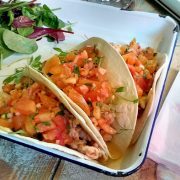 Generally, these tacos seemed a fresh and healthy way to accompany a couple of reds (probably not the best match, but who cares? ), and aside from the slight weirdness of the dish being partly warm, partly cold, I was all too pleased to scoff everything. 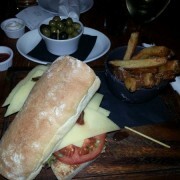 A side of chips added to the fun, with, would you believe it, Heinz tomato ketchup! I’d half expected it to be banned by that point after the “very serious health-scare”. Just in case, One Bourbon also provides other punchy ketchups, such as the sweet and mellow Smoggy Hog Smoked Chilli. 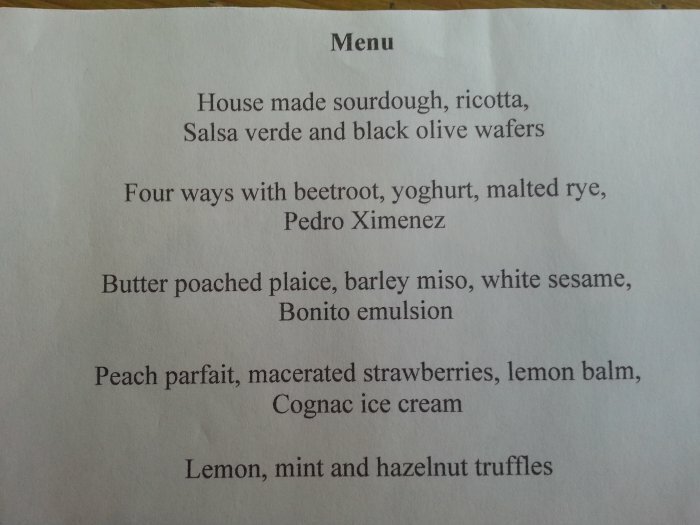 I’ve no idea if desserts were an option, as none were apparent on the menu – a pity, as although three tacos proved a relatively satisfying meal, a toffee pudding or something would have been suitable as a sort of mobile central heating solution for the walk home. For now though I’m off to stock-up on tomato sauce before it’s too late! After a few drinks with locals in the splendid glow of the Green Room, two things occurred to me in a flash of uncharacteristic inspiration. First, that I was extremely hungry, and second, that I’d (shamefully) never eaten in Nautilus, Fortune Green’s acclaimed fish restaurant and takeaway. I’d heard interesting things and was rather intrigued by its apparent bare-bones approach to pretty much everything. The first thing to point out is that Nautilus does not deep-fry their fish in batter; rather, they favour a matzo breadcrumb coating. My thoughts on this to follow, but there were other quirks I discovered which added to the experience. Service was delivered by two charmingly polite older ladies, and the interior is certainly traditional café or diner style – very casual, very unpretentious. Further bonus points for having tomato sauce in bottles – none of those stupid little mini-bowls which last for only about 3 or 4 dips-worth of chips! The menu is as simple as one can imagine; you can have a glass of wine – red or white, no further choice. I chose the latter, which was fine, and spent a few moments deciding what to order. I absolutely love salmon, and decided this would be an interesting test of the cooking technique. Dinner duly arrived, and my first thought was “goodness me, that’s a large portion, even for me!” but I soon discovered that the matzo coating was deliciously and deceptively light, and so crisp, too – an absolute joy in combination with the salmon. 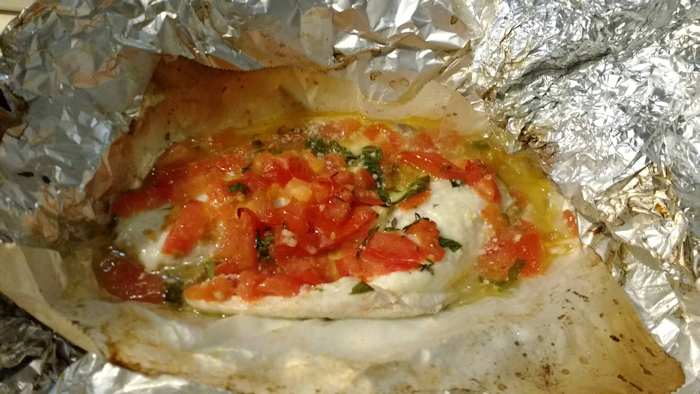 Enthusiastically tucking-in, I found the fish to be nicely gauged; not overcooked, still fleshy and supple. 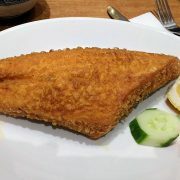 Really, a revelation; I felt a little silly for not having previously eaten fish fried in this manner, and honestly I was already thinking about what to have on my next visit. 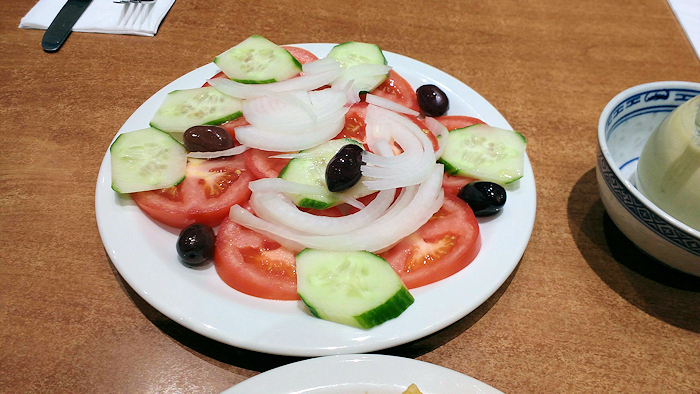 A side salad of tomato, cucumber and onion included some added olives (always a positive thing), but my portion of chips was the only minus point of the visit (I shall hereby rename them ‘blips’). Previously when I’ve grabbed chips from Nautilus as a post-pub refuel, they’ve been fresh and sizzling hot, whereas these were noticeably flabby and insipid and far from piping hot. A bit of an oversight given the nature of the establishment, so hoping this won’t be the case next time. In summary, enjoyable. Somewhere fun and relaxing where you can relish the simplicity of very fresh fish cooked in a style Nautilus have really mastered (pending better chips next time). As I’m always saying, I only choose the best for the captain’s table… All aboard! 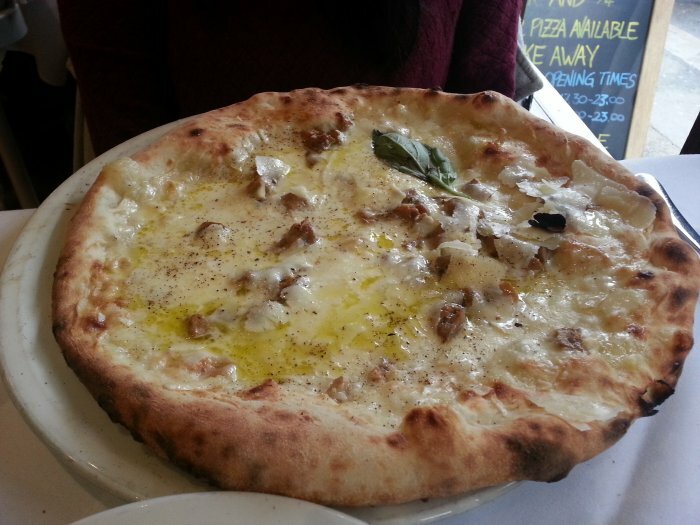 I don’t need much persuading to dive into a bowl of gnocchi, devour some sea bass, or demolish considerably more pizza than is really necessary, so I was all too pleased to join Jonathan on a visit to Finchley Road’s Italian relative newcomer, Fiddie’s. Having heard impressive claims from locals, we were curious to find out whether the food could reveal the same good-time vibes as the cheery, colourful furnishings, and ubiquitous film-star prints on the wall..
Jonathan, eyebrows raised in appreciation, seemed very impressed with his oxtail in a rich tomato sauce (no company should be allowed to use that term on a tin of beans), but wondered whether his rigatoni was perhaps just the wrong side of al-dente. 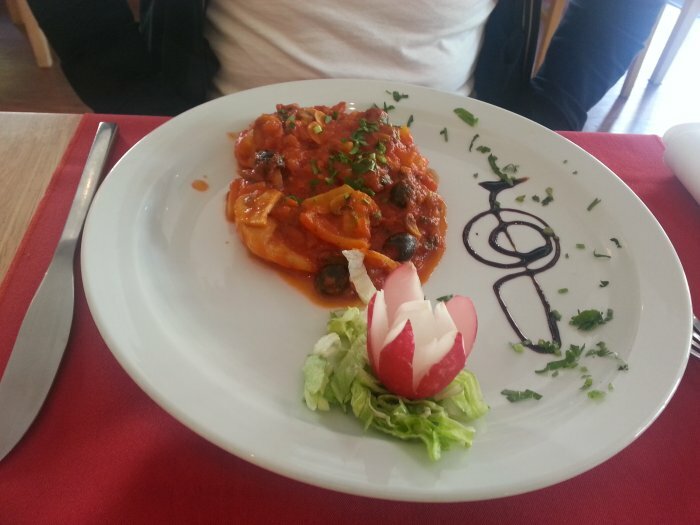 Upon hearing of this, an amusing scene ensued (not quite Faulty Towers, but still comical) whereby Fiddie brought out a side-plate taster of pasta from chef, with the idea (presumably) being to demonstrate that it was done exactly the same every time – to perfection! Jonathan maintained that some of the pasta had indeed been slightly undercooked, but I quite liked the self-belief and conviction chef had in his cooking. I noted several vibrant-looking plates arriving at other tables; everything appearing colourful and inviting. 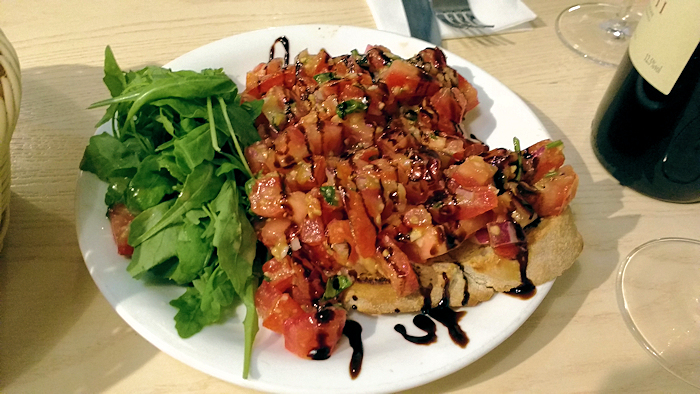 The menu has plenty for vegetarians, too, with a broad range of pizza and pasta dishes. The restaurant was busy, with plenty of atmosphere; it seems this little place has caught-on quickly. One can never have too many Italian eateries in the neighbourhood, and I’m looking forward to returning to Fiddie’s soon. As the old saying goes… if a diner’s tired of Italian food… that diner’s clearly tired of life. I was in a bit of a dilemma the other evening. Planning a king-size curry later on, I needed a reasonably light yet sustaining late luncheon somewhere, and decided Feng Sushi would be a sensible option. Quickly settling in, I admired the ever-pleasing view of West End Green, and the list of tantalising sake options on the menu. In fact, I chose a French white wine, which was quaffable, and then faced my next dilemma… what to select from a range such tempting dishes? I sometimes find this style of cuisine can be a little lightweight, but that was alright given my planned assignation with a king prawn jalfrezi with paratha and things later. I was to be surprised! My side dish of Miso Dengaku (aubergine with ginger miso dressing) was first to present itself on The Captain’s Table (still not bored of that one), and I was immediately struck by the stunning presentation, and considerable portion size (here I go again!) Sampling the dish, I’m pleased to report a genuine ‘food moment’ – absolutely sublime. Though aubergine can be difficult to cook really well at home (at least with my abilities), this was executed with precision; neat batons, fried with care, resulting in a satisfying snap to the skin, and so harmoniously matched with the dressing, which was thick in texture, and intense in flavour. 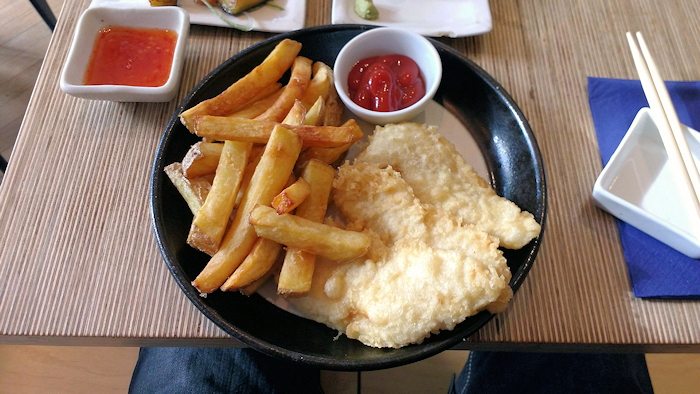 My Japanese-style fish and chips (splendid idea!) arrived looking stylish and highly appealing; three fresh-looking battered filets contrasted by some darker, very honest looking chips. I’d opted for six tuna and avocado maki as a side (which were most agreeable, as such things always are when of decent quality) and by this time I was rapidly realising that my “light lunch” was evolving into a bit of a feast! Comparison with the British version of fish & chips? 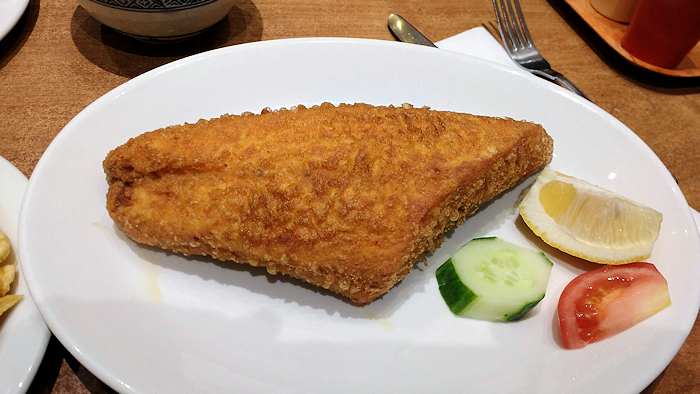 The batter is a lighter tempura style, and the fish much firmer and compact. Different, but very… “eatworthy”. The chips were not fancy triple-cooked variants or anything, rather more traditional, and sensibly, tomato ketchup was provided. To summarise, I’d happily order the same three plates again, as soon as possible. 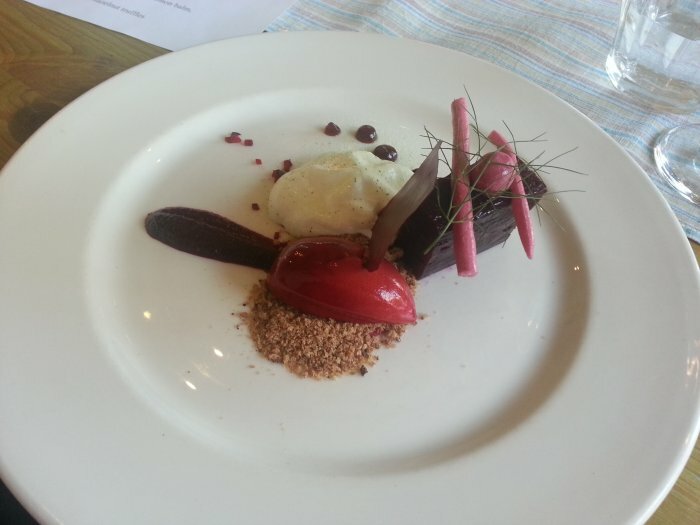 Inspiring food – left me feeling genuinely uplifted (I’m a simple soul). As for the curry – that wasn’t required in the end, though I did make up for it with two curries in two days the following weekend. 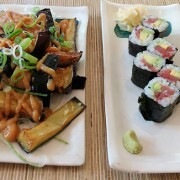 Get along to Feng Sushi, for goodness “sake” ! Predictably, I’ll start with the take-away only Tiffin Tin. It’s not that these guys give me back-handers (bribery would work, it’s just that no-one’s offered yet), it’s simply a case of wonderful food, and remarkable consistency. 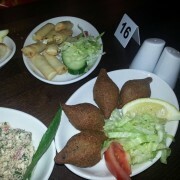 The dishes feel healthy, yet robust, with hunger-bashing portion sizes and appetising aromas of freshly ground spices. 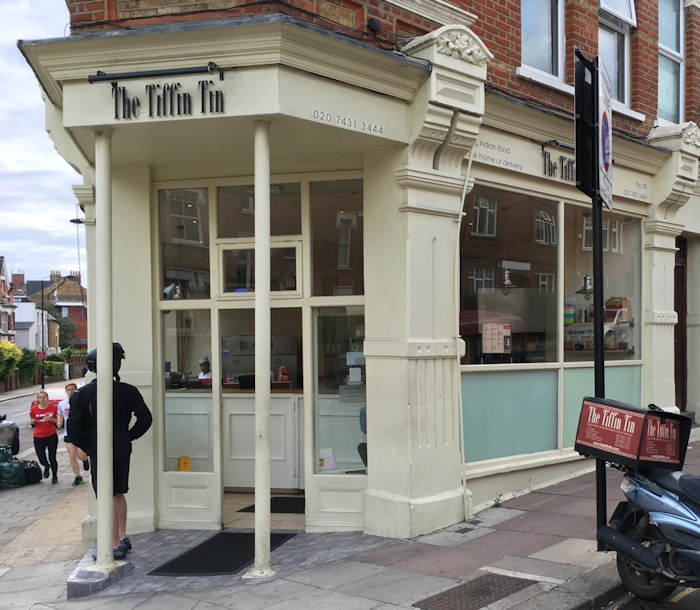 The Tin has only ever got one order wrong, delivering some lamb samosas I hadn’t ordered – but those rich, flavoursome morsels were impressive all the same. 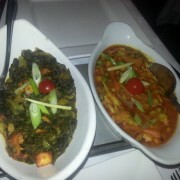 My favourite dishes; the Goan salmon (tantalising flavours, perfect heat) and the koshi machhi. 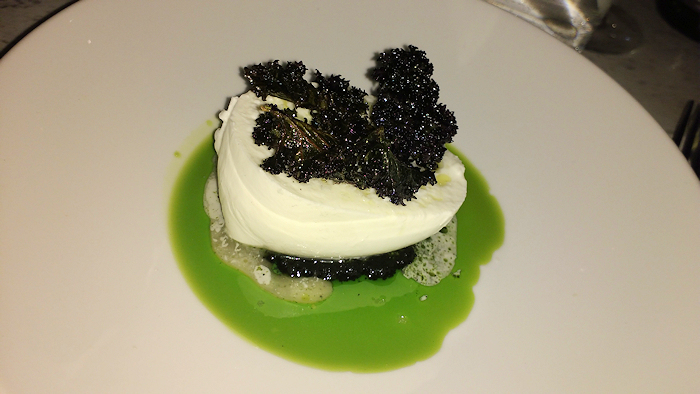 Note also the excellent vegetable-based dishes – brilliantly done. 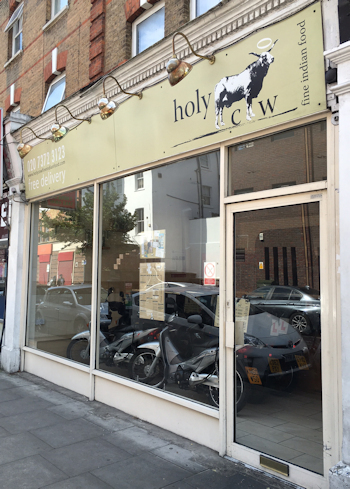 A comparable alternative might be Holy Cow in Kilburn. My findings a while back were of high-quality ingredients and assured cooking. Strangely, their delivery menu appears identical in parts to the Tin’s. The consensus on Twitter has generally been that it’s good quality, but on the pricey side. Bengal Spice on West End Lane offers a more traditional experience, with a wide range of old favourites served in the same way I remember as a greedy teenager. Recently I enjoyed a tangy, vibrant prawn madras but if this had a hotness rating of two chilli symbols on the menu rather than three, then I respect the bravery of whoever tries the vindaloo! The salmon tikka starter was also excellent. 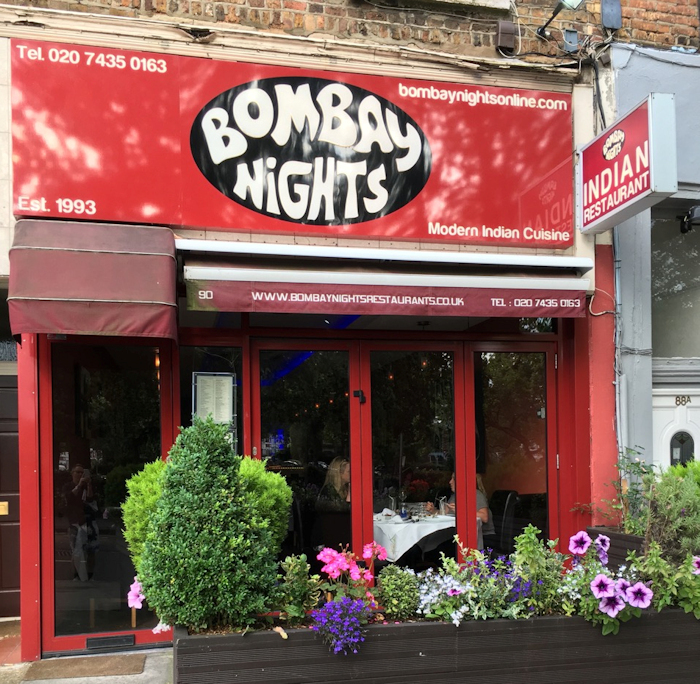 Bombay Nights in Fortune Green, again long-established, features a joyful logo and a nice balance of expected and less-common selections, which include scallops and crab in addition to a wide range of chicken and lamb plates. 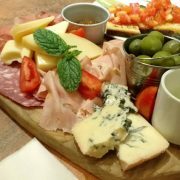 I’ve enjoyed dinner there, and am impressed by its enthusiasm in updating its Facebook page with colourful and tempting photographs – the owners seem proud of what they do. 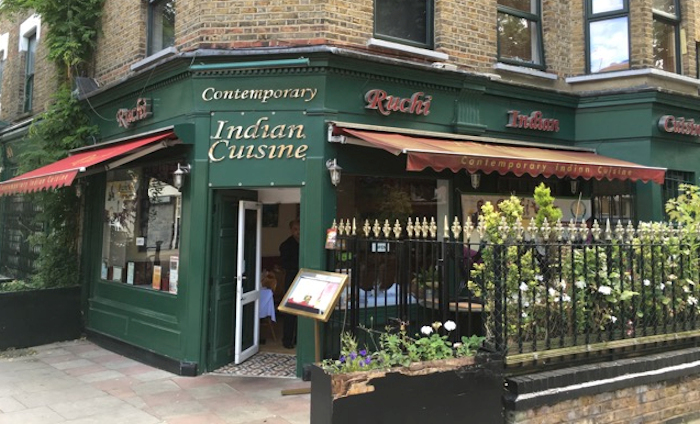 There are of course plenty of other Indian restaurants to try in NW6; we’re lucky in having such choice, and maybe this continues to drive quality? Everyone who enjoys a curry has their own personal tastes and preferences, whether it involves an overload of chicken (Jonathan), or proud, glowing prawns (me). Well, I’ve worked-up quite an appetite absorbed in all that… time to grab a corkscrew and a spice-orientated delivery menu ASAP. Rolling up to the new Vietnamese restaurant on Broadhurst Gardens, one remembers this isn’t the easiest place to maintain such a business. Our much loved, much missed Spiga put up a brave fight and, more recently, Mamako weathered an early storm to regularly win praise. I’d honestly thought the eatery was named Phan Tom, which appealed to my gormless sense of humour for several reasons; however once we started eating, we found nothing too ghoulish in the fare. 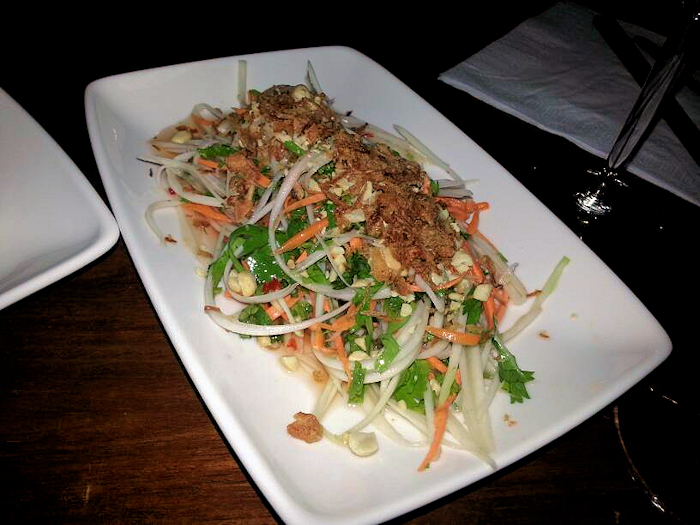 Wonderfully addictive salt & pepper squid lifted our souls, accompanied by a brilliantly flavoursome green papaya salad, positively shimmering with its multidimensional dressing. A side of chargrilled aubergine worked well with everything else, and the Morning Glory greens with plenty of garlic were generously seasoned, demonstrating how delicious such simple vegetables can be, their naturally bitter tones complementing the sweeter tastes on the table. 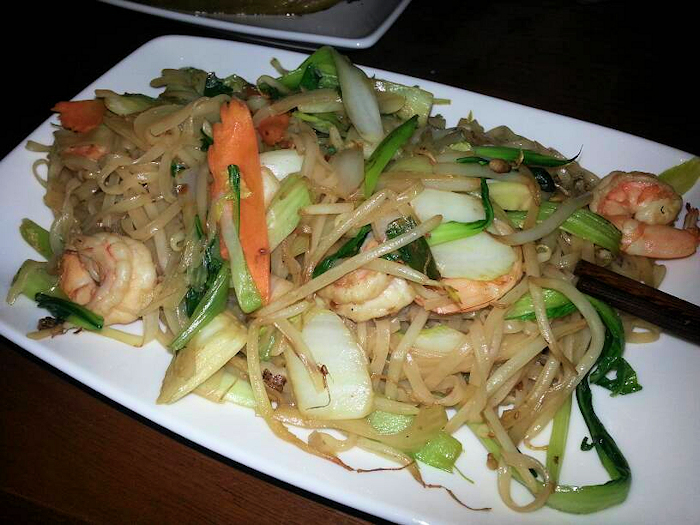 In fact my main of wok-fried pho noodles with prawns was perhaps the one dish which lacked a little firepower. Maybe it suffered somewhat from Whamplord and I spending ages over the starters as we enthusiastically argued over how much the décor had or hadn’t changed (true rock ‘n’ roll rebels, us two) – arriving with the crustaceans slightly tired (not unlike me the next morning) – and with the dish needing a resounding bang of something to elevate it. 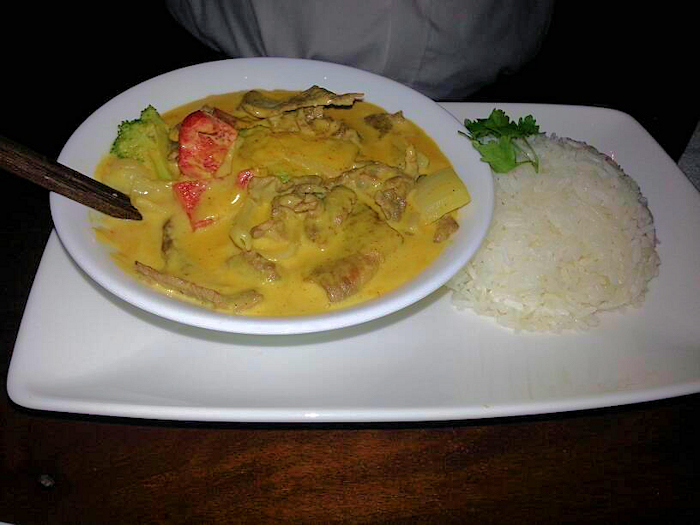 However, Jonathan was satisfied with his beef curry, which was pleasingly warming and vibrantly yellow. Subtle and enjoyable rather than head-zinging, but as he said, “that’s just fine for a relaxed meal with friends.” We washed down everything with a bottle of Chenin Blanc from the restaurant’s short but perfectly acceptable wine list. All things considered, then, a rather positive start. Front of house was warm and enthusiastic, and the food had a sense of class to it, but without being minimalistic or silly; all nicely gauged. And if they won’t call it Phan Tom, who cares, that’s what I’m calling it. We’re back in business, #whampers! 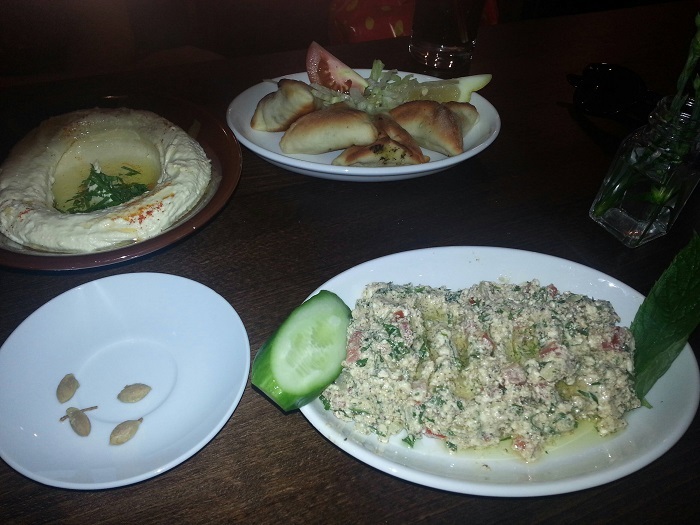 Feeling a little light-headed after too much sun (OK, wine), and in need of something a little different to seek out, two of us headed to Cedar, the immediately popular new Lebanese restaurant on West End Lane. First impressions were promising; the interior seemed bright and airy, and very relaxed, so much so that one customer decided to enjoy a couple of cigarettes actually inside the premises! He was right by the open frontage though, and not really doing any harm – it was early evening and unusually quiet. Fatayer – a baked pastry stuffed with spinach, onion and herbs proved a decent start, and then kibbeh yakteen was also a hit; deep fried pumpkin and crushed wheat shells housing a pleasing combination of spinach and chickpeas. Spicing was well-judged, with that satisfying ‘warm’ taste and aroma I associate with this sort of food. Hummus, pita and falafel were fresh and pretty much as one would expect, and cheese rikakat, deep fried haloumi in filo pastry, added something else to proceedings. Shank leesh, (aged cheese with tomatoes, onion, green pepper and thyme), had its own character with stronger flavours – probably my favourite plate. 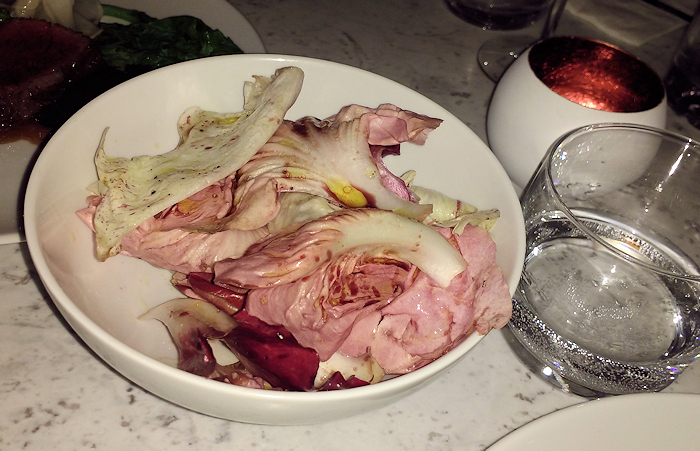 That said, I absolutely loved the little intro of pickles which arrived soon after we sat down; I learned these included turnip slices pickled with beetroot juice – quite delicious. …Lebanese-style pizza? Seriously, what’s not to like!? 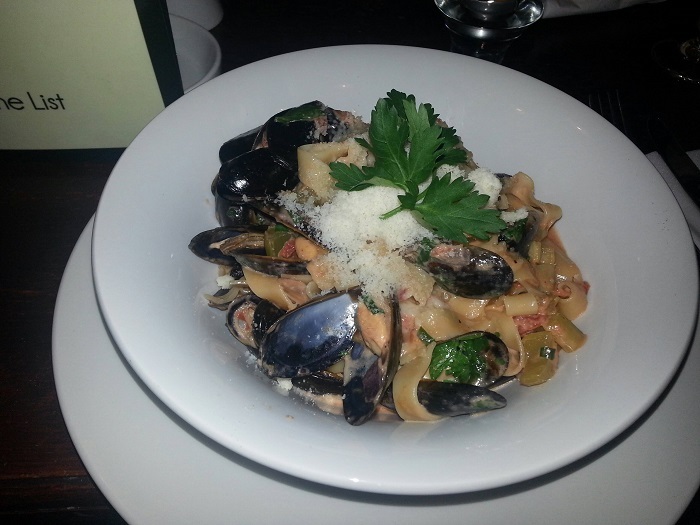 I tucked into mussels tagliatelle; celery, tomato, white wine, cream and Parmesan merging nicely together to coat very well-judged pasta. Plenty of it, piping hot, proper food. 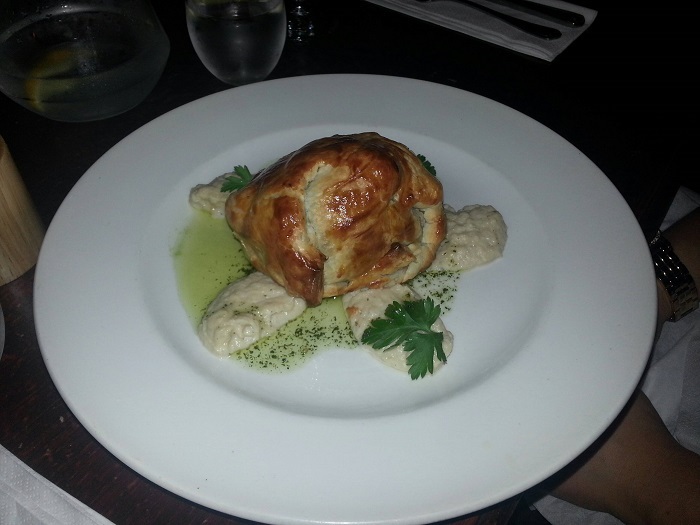 Friends eagerly devoured a Parma ham-wrapped salmon with elegant little lentils shimmering like jewels in a yoghurt-based sauce, and a veg wellington which was apparently really decent; such an encouraging sign when fair attention is given to vegetarian options. A bit odd not to show sides on the menu, but we were able to order some greens and things; the waiter was entertaining and polite at the same time, ensuring we all had a thoroughly splendid time. Wine was excellent, and our only regret from the evening was not quite being able to manage dessert; full of my favourite things like brownies, crumble (apple and blueberries are on the current menu – sounds lovely), banoffee or key lime pie… And as for the cheeseboard, last time I chose that option, mellowing out on a leather sofa one lazy Sunday afternoon, it proved such a generous portion I didn’t eat again all day… fantastic! 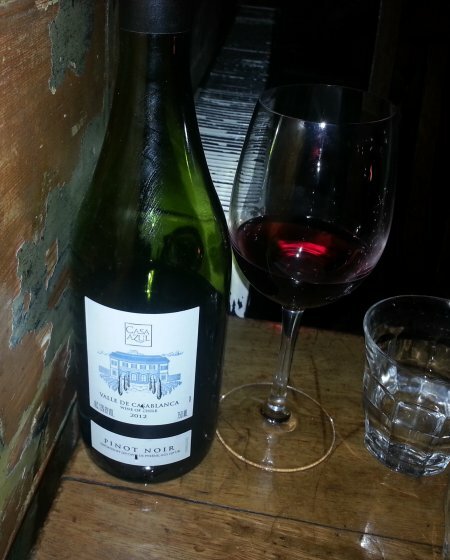 Black Lion Kilburn… I raise a hearty glass of Malbec in your direction – and we’ll see you again soon. Huevos rancheros in El Rocio (formerly Sirous) seem to be proving very popular with locals at present, and it’s a breakfast dish I was all too pleased to sample myself the other week, after one too many the night before (note: “breakfast” for me at the weekend usually takes place between 1 and 2 o’clock). 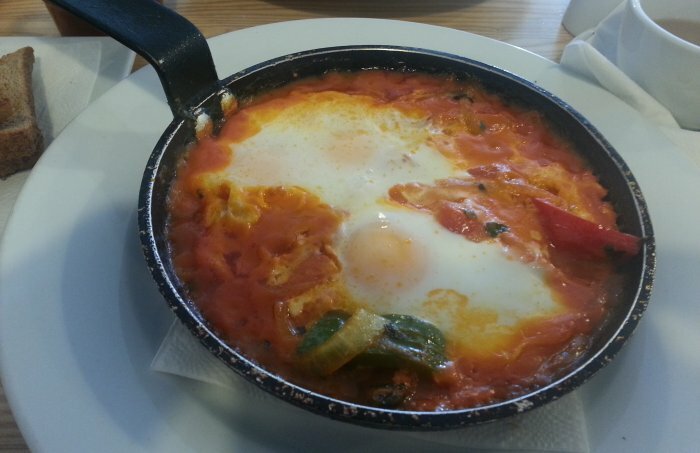 This Spanish variant is described on the menu as pan-“fired” peppers, onions and coriander, simmered in tomato sauce and somehow “toped” with three eggs! Regardless, it was a merry plate of colourful, flavourful food, with the eggs just-cooked, and all served still sizzling in a pan – most satisfying. The new layout inside features colourful red seating and pleasing decor, though I do miss the old leather sofas and the tasteful illustrations of root veggies which used to adorn one of the walls. Tapas are of course still on the menu, and a few weeks previous I particularly enjoyed the octopus. 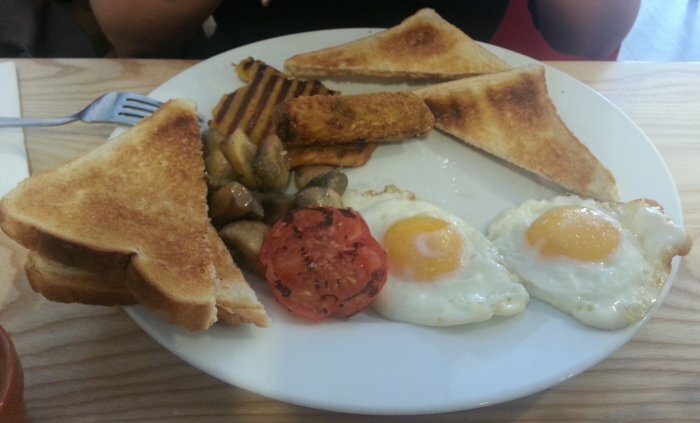 A large vegetarian breakfast was also devoured (not by me I hasten to add, though I did eat a large Domino’s a few hours later), and certainly seemed a success, though perhaps fresh, home-made fritters and veggie sausos would add appeal? El Rocio is popular for breakfast, and I sense customers wouldn’t mind paying a bit more for a couple of high-quality tweaks. Writing a few notes here has given me a good idea (happens very occasionally) – I’m off to the forum to post a new question… best hangover food? 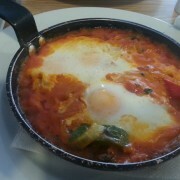 Huevos rancheros are definitely right up there! I’m not really one for New Year’s resolutions, but one thing I had pondered was the vital importance of eating and drinking more than I did last year. With this remarkable gem of inspiration in mind, I grabbed a menu in La Brocca (whilst enjoying a Malbec), and settled in by the open fire… well, a piping hot radiator at least. 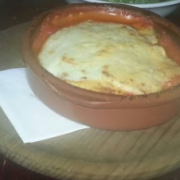 I’d been meaning to try the baked spinach and ricotta cannelloni, with tomato and béchamel sauce, and it proved a satisfying winter-warming dish, as I’d hoped. Served in a pleasing terracotta bowl as with the baked gnocchi I often enjoy, it again reminded me of some basic rules of good cooking; make simple, appetising dishes, and do them well, in decent-sized portions, for hungry people. Success! Rich, melting, tomatoey and well-seasoned. Accompanying the cannelloni were old favourites of sun-dried tomato pesto and avocado bruschetta (always excellent), with a mixed salad which also included ripe avo. The world needs more avocado! I was pleased to find The Salt House on Abbey Road still a characterful pub after its recent refurbishment; it requires a subtle balance when a boozer aims for seriously good food but in a relaxing, pint & paper environment. Equally pleasing was the quality of the cooking. Starters of smoked fishcakes, creamed leeks, mustard and chives, and goats’ curd with honeycomb and brioche, were delicately made and presented, with lively flavour combinations. £7.50 each, but the kitchen skills were evident. Was this taken after he’d already eaten half? 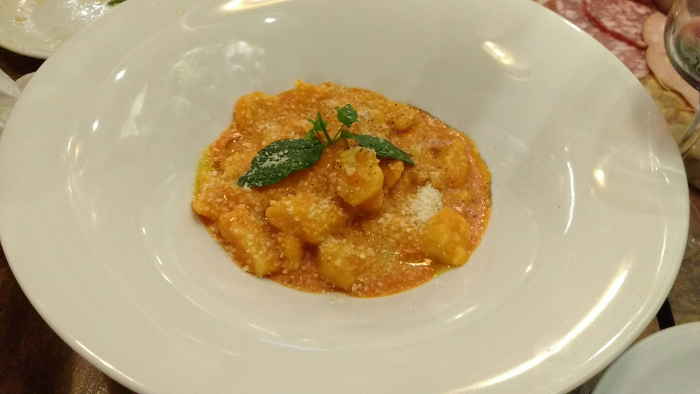 My star dish (and that of madam – who was in uncharacteristically unfussy mood) was a refined gnocchi of sweet potato, with roasted garlic and herbs. Delicate, light, and rounded off very nicely with Parmesan shavings. A simply lovely dish, so why not put a little more of it on the plate? Yes, the style here was most definitely upper-level pub grub, but for £12+ I felt it could have been a touch more generous – and I hope chef will take this as a compliment, as it was most definitely a delicious plate. I’ve had some decidedly odd eating experiences recently; stroppy staff, missing items, and having to request being moved to the basement dining room due to the… errmm… ‘personal issues’ of another diner. So it’s reassuring to know there are establishments getting the basics right, even if my greedy appetite wasn’t completely satiated on this occasion. Enjoyed a bit of a feast at Wagamama in the O2 Centre recently, partly due to the generous vouchers sent to Diner HQ, and partly due to sheer greed. 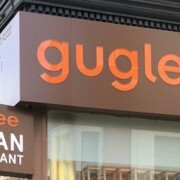 With enthusiasm to give the menu a decent examination, three of us settled in with a nice bottle of Pinot Grigio to see whether this popular chain restaurant could compete with local independent noodly favourites. 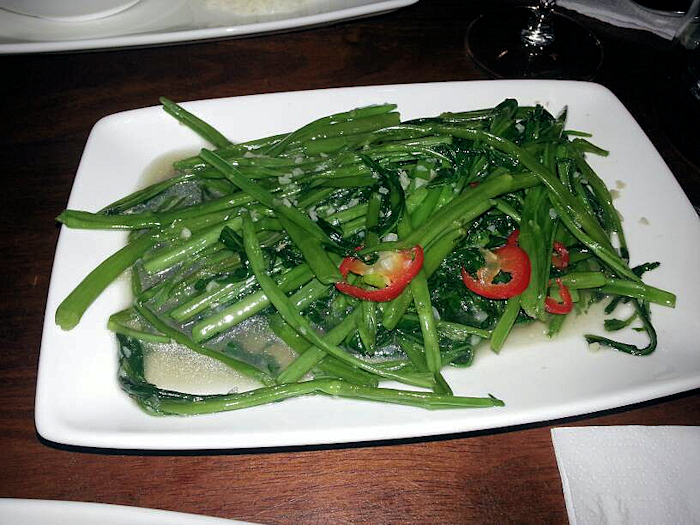 Whilst Nicky wasn’t a huge fan of the pork ribs, finding these types of things generically greasy, Jonathan happily got stuck in, whilst I devoured some wonderful, garlic-laced, wok-fried greens – a simple dish we all enjoyed. Also scoring points for healthiness and taste was goma wakame salad; Nicky describes this as “a Japanese-style ‘coleslaw’ of seaweed, with crunchy carrot and sesame seeds”. I concur, and with its subtle dressing, this was a delicious and fresh plate that I’d have as a side rather than a starter. Chilli squid proved pleasant enough, as did Jonathan’s main of beef teriyaki with soba noodles. The yasai chilli men (sounds like Lego people running their own noodle bar!) was a winner – Nicky described it as being “like a fusion of an Italian pasta dish with Asian flavours and noodles”, and indeed it was a fine dish, colourful and zingy with a very pleasing chargrilled flavour to the chunky veg. 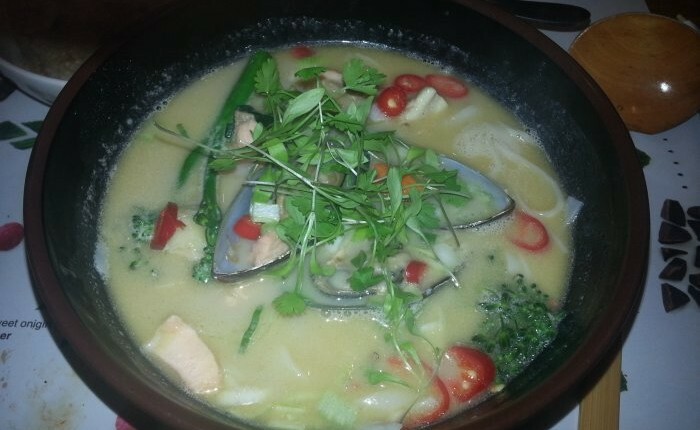 I tried a new summer special offering, the coconut seafood broth and, as with last time I had a soup-based dish in Wagamama, I was surprised and actually quite enthralled by the depth of flavour – absolutely brilliant and perfectly balanced in that hot, salty, sweet and sour way. 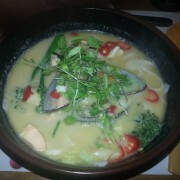 The seafood within was fine, but that broth, I’d have gone through gallons of it. It even seemed to work with the Pinot Grigio (second bottle by then!) quite well. Desserts were a bit of fun; I had some miniature cheesecakes and things, while Nicky gorged on black sesame ice cream mochi, which Jonathan and I snobbed-out at due to their rather odd, gelatinous coating. 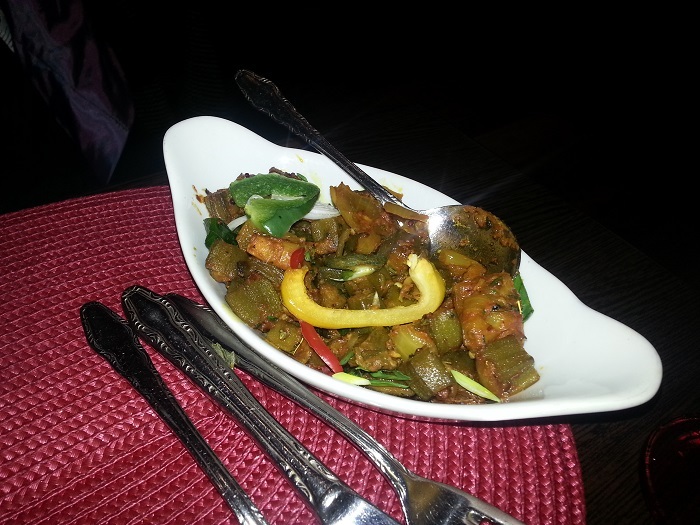 Easy to sum up this one – enjoyable, satisfying food, nice and fresh, and strong on pungent, spicy flavours. Decent portions, with more character in the dishes than one might imagine from a chain eatery of this type. 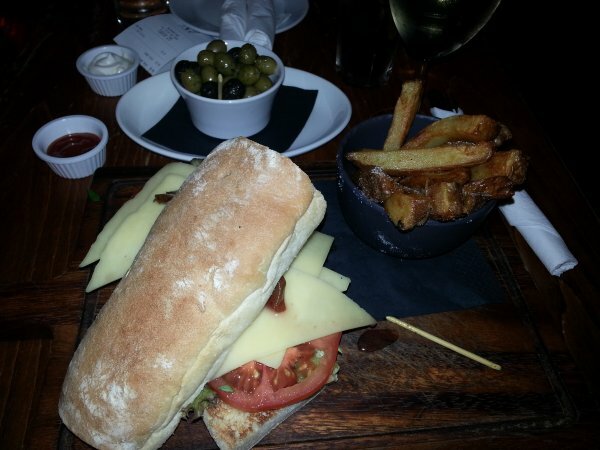 I also consider this might be very good hangover food… so I expect we’ll find reason to pop in again soon! Best dish was a mutter paneer variant, which was quite addictive and lively, with a decent, tangy sauce and cheerful cheese cubes. Sag paneer also pleasing. The paratha was well made; buttery, flaky and fresh. A veg curry was a little underwhelming though; rather simple, a touch bland, and lacking a variety of vegetables (pretty much cabbage, neat little carrots, and peas). Quite enjoyable all the same, and with a nice touch of fresh spring onion scattered on top. I was somewhat confused by ‘cooked in plum tomatoes’ describing the dish, as these seemed absent, though perhaps they were blended within the orange-coloured sauce (which didn’t seem tomatoey to me). Bombay’s service was warm, but alas so was the house “Champagne”. It was decent to be informed that they didn’t have any cold ones left, and with the next option being twice the price, we were offered a £5 discount if we did decide to upgrade our choice. I tried to haggle for this offer on the original bottle, accompanied by an ice bucket, but settled for a £2 reduction instead. There are some lovely sounding dishes, and I’ll likely be back, but I’ll be hoping they up the ante a few notches if I’m to be regularly dissuaded from lazing about at home with a Tiffin Tin. 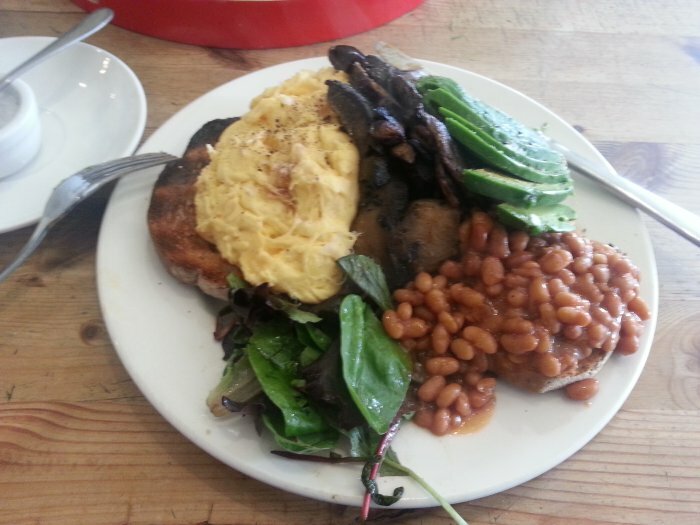 I’ve never quite understood the term “brunch” – it sounds like it was coined in West Hampstead – by Jonathan, probably. It’s either breakfast, but a bit late, or it’s lunch? That said, technically speaking, brunch can apparently run from 11am to 3pm – so who am I to question it? 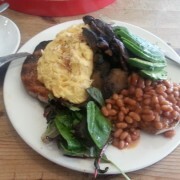 Anyway, I experienced brunch at Mill Lane Bistro last weekend – and a jolly good start to the day it was, too. 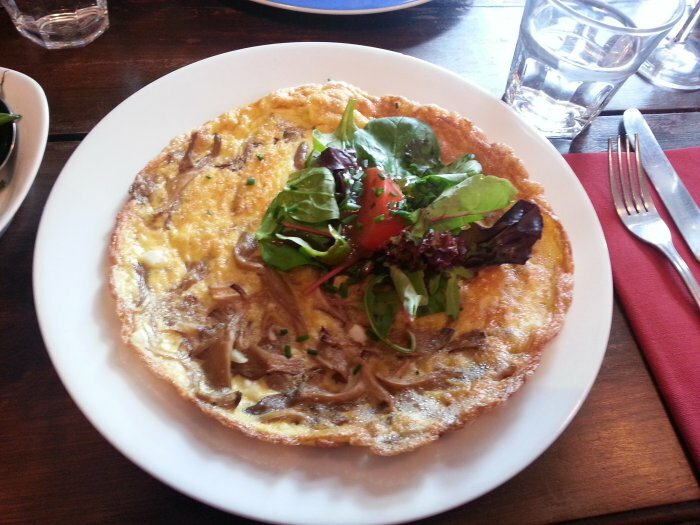 Whilst tempted by a poached salmon salad on the specials board, an annoying hangover drew my attention swiftly back to eggs, and in particular the garlic mushroom omelette. 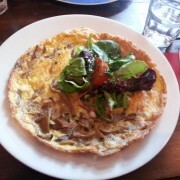 This was a refined yet rustic omelette, well seasoned and with an excellent textured edge to it. Good, simple food, for a bad good, simple man. I also ordered a generous portion of green beans (again well seasoned, and buttered), and some chewingly good, wholesome bread. All reassuringly satisfying, and helped along by a glass of something red (can’t stand the term “washed down” – unpleasant). The bistro celebrated three years of Cyril’s ownership on Saturday, so let’s all raise a glass, and eat more omelettes (preferably with a ton of garlic) to celebrate. After all, we have to commiserate each other on the failure of our football teams, albeit France lasting a little longer than England. OK, quite a lot longer! I was grateful to receive an invitation to A Sweet Night Out – the new supper club being run out of The Kitchen Table on Mill Lane. It was a very informal affair, with groups served pretty much as they came in, rather than together. This presumably helped the kitchen to cope, and contributed to the fact that the food was flawless and technically amazing. Attendees were required to bring their own booze; Andrea at Vini Vini next door had been given the menu and was ready to make wine recommendations, red or white, according to people’s budgets. Kicking off proceedings was a plate of sourdough, with ricotta and a salsa verde, the latter wonderfully rich with basil, and both scooped up with black olive wafers; intriguing little shards which prompted me to ask chef Sean how they were made (though I promptly forgot his explanation, of course). An impressive introduction. 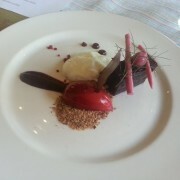 Next up was beetroot four ways, with yoghurt, malted rye and delightful little bloblets of Pedro Ximenez sauce. Vibrant flavours, with sweet, sharp and tangy elements rounded off by the PX (which perhaps might have benefited from greater quantity). 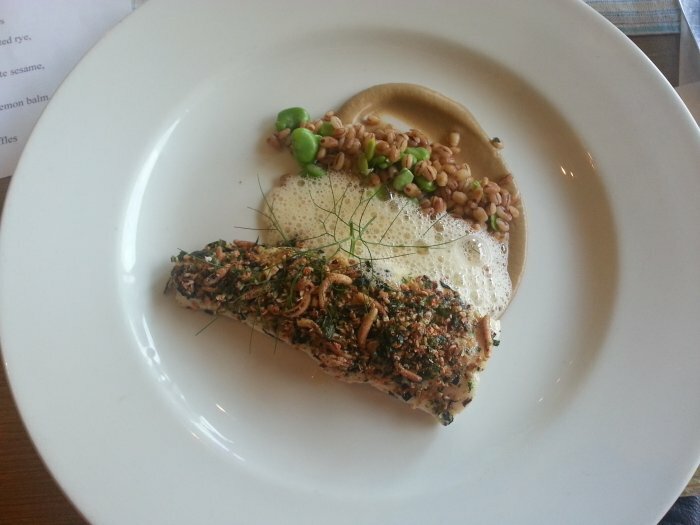 Butter-poached plaice, barley miso, white sesame and bonito emulsion followed, which had me all confused over which was which, as I was naively clueless as to what bonito actually was. 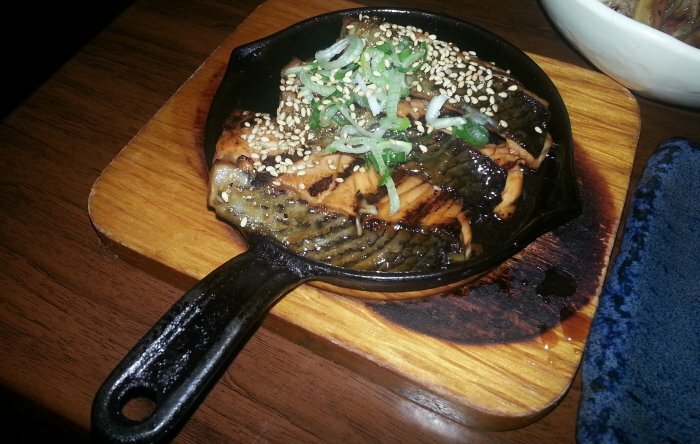 The plaice, advised the waiter, was comprised of two fillets pressed together, to give it more physical dimension, and was cooked with immaculate precision. It’s a cliché to say food “melts in the mouth”, but this did. 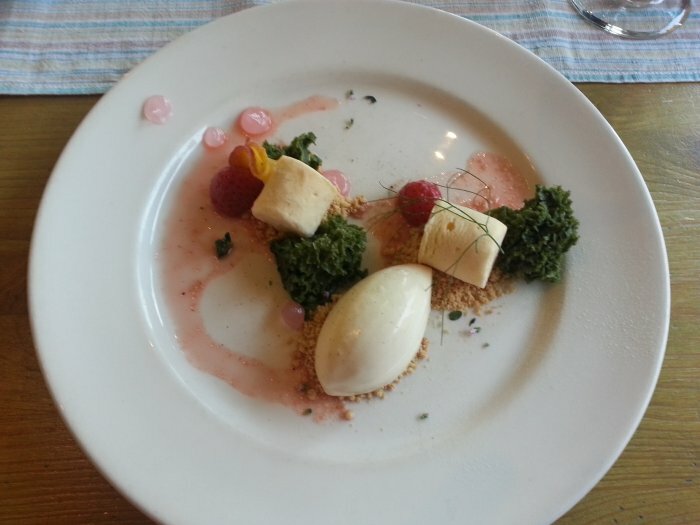 A dessert of peach parfait, macerated strawbs, lemon balm and Cognac ice-cream was fun, interesting and refreshing, though the flavours here were a little more understated….or perhaps tanning a bottle of Valpolicella in half an hour had dulled my taste-buds, brain, or both! Possibly a more integrated, social approach might be worth trying, though for large numbers I imagine there are challenges.That said, I enjoyed chilling out with a newspaper and eating these types of dishes without a care in the world. A great success, certainly, and a welcome opportunity for locals to experience some fascinating fine-dining in a relaxed environment. A sweet night out, indeed. Really delighted with The Gallery’s new venture hosting jazz in its basement bar. The room’s perfect for jazz; it has character, with sofas and chairs strewn around somewhat haphazardly, its own piano, great acoustics, and…..food available, as upstairs in the main bar. Deciding something substantial was needed (I hadn’t eaten for at least an hour or so), I cleverly constructed an order comprising of the baked mushroom and cream cheese crêpes, with chips accompanied by mayo and ketchup. Clearly, my creativity knows no bounds. 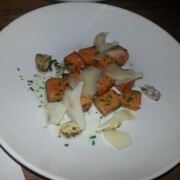 I have to say I was most impressed by such a simple dish being so satisfying. Plenty of mushrooms in a well-made pancake, and the cream cheese flavours blending in to create a very decent dinner. A handful of ingredients, a plateful of enjoyment. 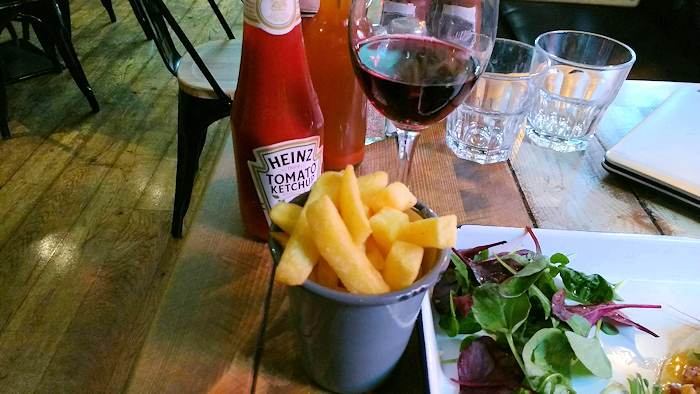 Chips were also very well executed; and fears that the little bowls of sauce might not be sufficient proved unfounded (I do prefer a bottle of ketchup on the table – makes me shudder with intense anxiety thinking there might not be enough). Less pleasurable was the complete absence of the stated kale, and “purple sprouting” (let’s assume broccoli). Ironically, this didn’t spoil my enjoyment, as I only realised afterwards, but items entirely missing have to be classified by this greedy writer as a serious food crime. But let’s focus on the numerous plus-points. A fantastic jazz band, good wines (I enjoyed a Hungarian Pinot Noir, which was delicious), a great atmosphere, and Sunday night pub food very nicely cooked. Many of you will know that our first visit to Mamako was a bit of a disaster. 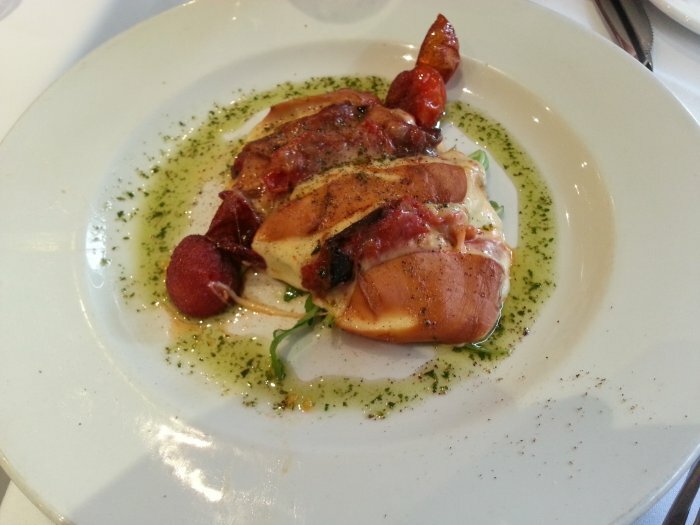 We did say, however, that the food was good and we’d give them some time to settle in before reviewing it properly. That time had come. Last Wednesday, five of us went to give the place the once over. Mamako retained much of the decor it inherited from Spiga but the cuisine has shifted from the Mediterranean to Asia. 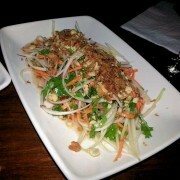 Perhaps too much of Asia, as Thai, Japanese, Malay, Koraean and Vietnamese dishes all seem to compete for attention. Malaysian cuisine is something of a hybrid of Chinese and Indian food with rich curries such as beef rendang as well as classic noodle and rice dishes such as Mee Goreng and Nasi Lemak. Menus are flipside of the place settings and it’s hard to choose from so many options. Perhaps aware of the service issues that dogged our opening night meal, we were asked to order starters first and mains later. We shared deep-fried squid tentacles, chicken gyozas, vegetable Malay curry puffs, Vietnamese rice rolls and Toor dal fritters. The squid was the let down of these, the batter wasn’t crispy enough and the squid was perilously close to being undercooked. However, the other dishes more than made up for it, especially the toor dal fritters, which had a comforting warmth of spice to them, and the Vietnamese spring rolls, which come more generously stuffed than those at Ladudu. 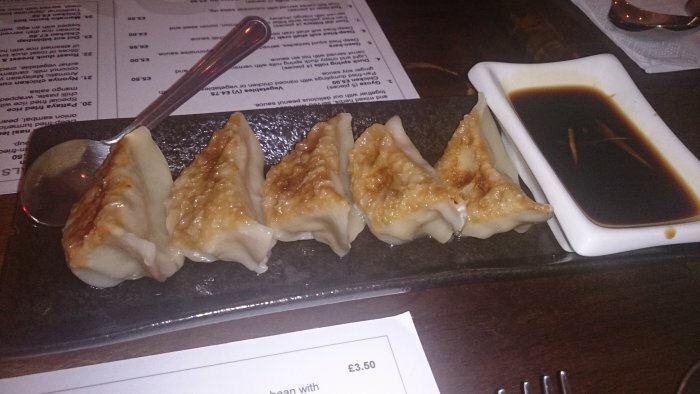 Gyozas were fine, though it’s getting to hard to stand out with this ubiquitous starter. The Malay curry puffs, which are a bit like samosas, were also good. I eschewed all the other cuisines for my main course and went for what Mamako does best: Malaysian food. I’ve loved beef rendang ever since I first had it in a Singapore shopping mall severely jetlagged and with no clear idea what it was I ordering. 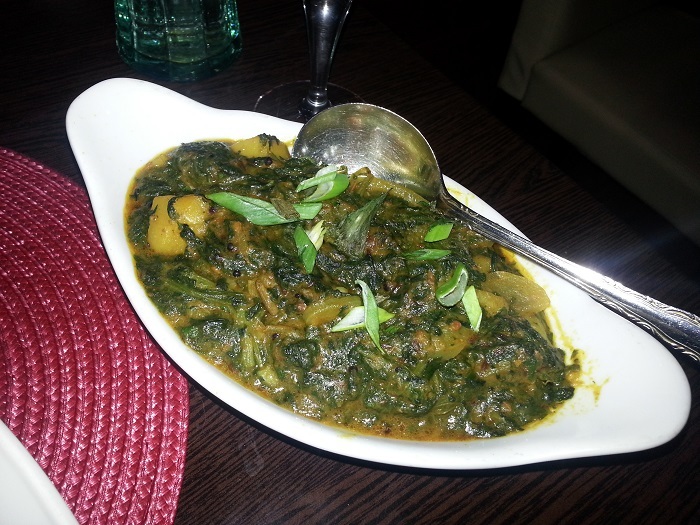 The short-lived Ammis Curry in Kilburn did a kicking-hot version that oozed flavour. 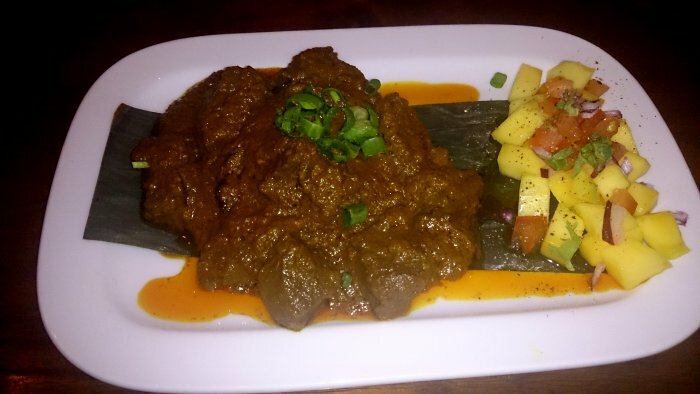 Banana Tree does a decent rendang though twice I’ve had it there and it’s been too dry (the sauce should be dry, but the meat should be tender). How did Mamako’s stand up? Very well. The consistency and texture was about right – I would have liked it a little hotter and that deep meaty aftertaste wasn’t quite there, but I’d very happily order it again. It does seem odd that the menu is quite so pan-Asian – SE Asia would be enough for me – but I did enjoy all the regional foods we tried. 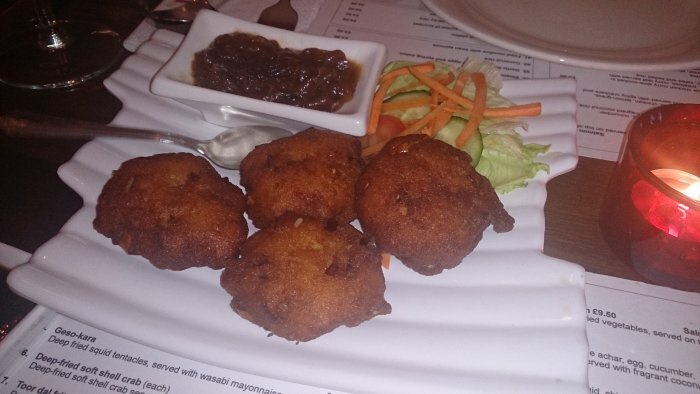 The lentil cakes were delicious with their chutney as a starter. I chose the Mee Goreng for my main (not Nasi Goreng as I described it, gently corrected by Nicky who explained that Nasi means rice and Mee means noodles). Everyone was wide-eyed at how large my dish was but I ended it up eating it all because it was so delicious. I really like Mamako, especially for its fresh ingredients, careful preparation and lack of excessive sugary-salty-fatty sauces that some pan-Asian places rely on to satisfy our cravings! Service was warm, and with more confidence than in their anxious, early days, and the whole place had a sense of things settling into a rhythm. Starters were enticing. The little parcels and morsels were flavoursome, with fresh, pungent spicing, and fantastic textures on the outside. Squid had wonderful, light batter, though were a little lightweight given the tentacles were best discarded. 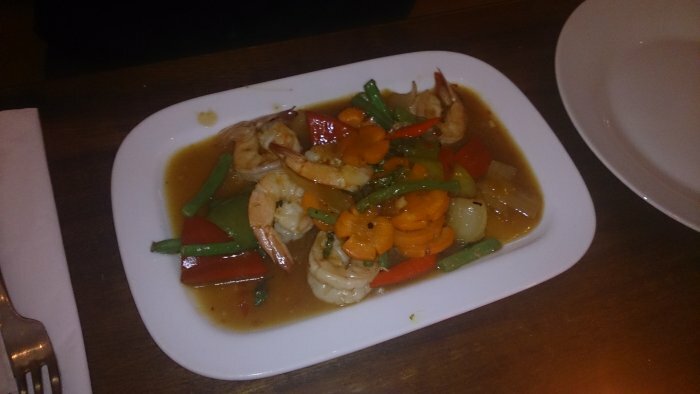 My phad kraphow with prawns, chilli, garlic and sweet Thai basil, fried with vegetables, was also impressive, though more variety in the veg would have perhaps added an extra dimension. 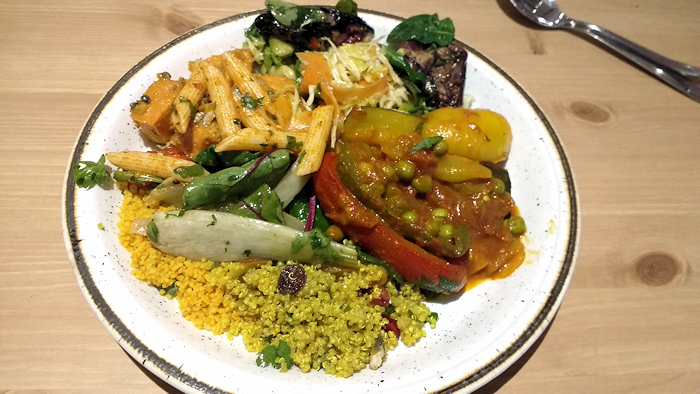 Everything we ate was well-seasoned, with deep flavours coming from various different angles. Sides of bok choy and egg-fried garlic rice were very good, while my noodles were a slight let-down as were overcooked for my tastes; too soft and mushy. Worth noting the Tempranillo, which at £3.75 for a (175ml) glass was a surprise; really, really lovely. Ending with a sake was pleasurable, too! 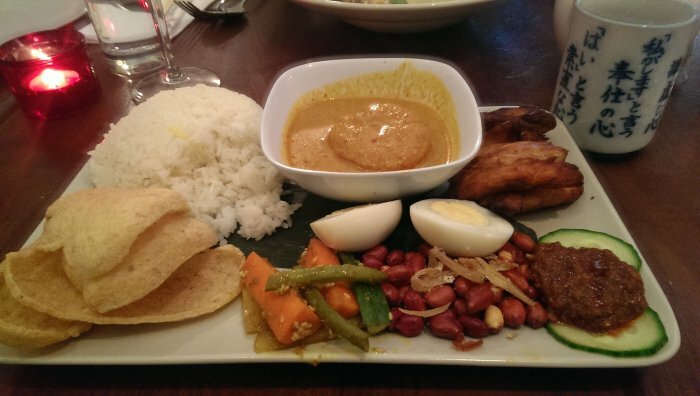 Being a fan of Malaysian food (and half Malaysian myself) I was keen to try the unofficial national dish, nasi lemak. It’s coconut rice, traditionally accompanied by cucumber slices, egg, peanuts and spicy sambal sauce. Mamako’s version may not have had the ‘wow’ factor that won this year’s Masterchef title, but it was a good interpretation of the dish. Often eaten for breakfast in Malaysia, here it was made more substantial with some fried chicken and a small bowl of creamy – but fiery – curry sauce. The sambal tasted authentic with its inclusion of anchovy paste and chili kick, and there was also a welcome crunch and freshness from the pickles on the side. Overall it was an enjoyable evening. The ambience is slightly sterile – be prepared to bring your own atmosphere – but the food is fresh, feels authentic and is reasonably priced. 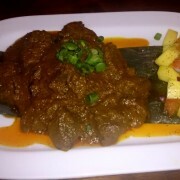 I’ll be back to Mamako to sample the rest of the menu, Malaysian and beyond. We were made to feel very welcome at Mamako, attentive service without being crowded and the atmosphere was nice, with background music playing at the right level and good lighting (are those amazing lampshades a remnant of Spiga?!). 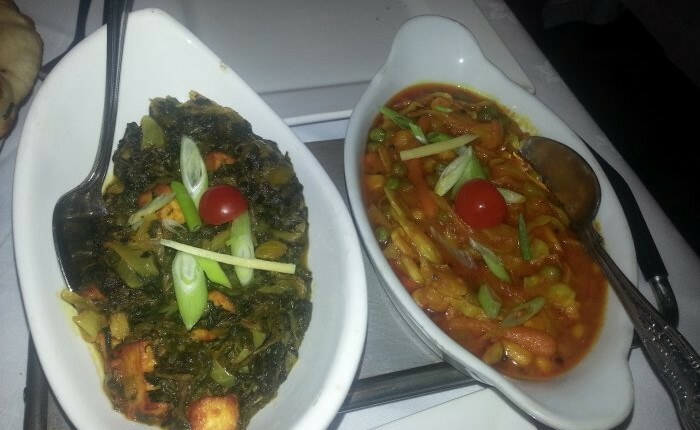 The quality of the food was good and I would consider it very good value for money. Geographically the menu is pan-Asian, though I think we all plumped for Malaysian main dishes, which seem to be the speciality. 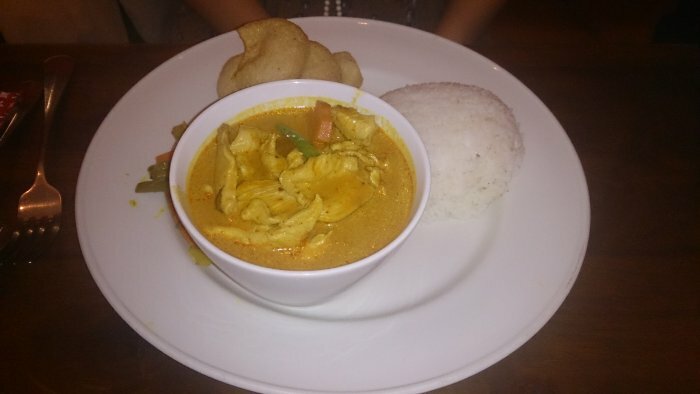 The chicken curry was really well cooked, fragrant with a bit of a kick but not face-meltingly hot and a good size portion. The selection of starters we tried were all tasty, but for me the stand out dish was the dhal fritters, which were delicious and I could have eaten a whole plateful! 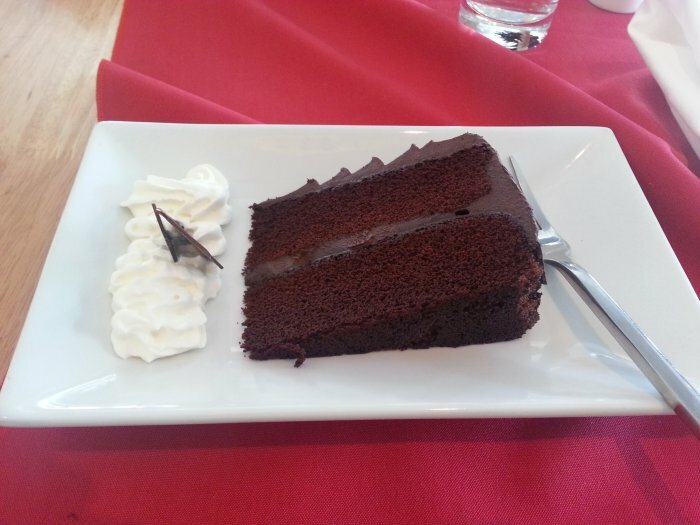 We were all too full for desert, so I look forward to a return visit to sample more of the menu. A great addition to the local restaurant scene. Did Tom think all was good at Tuttobene? 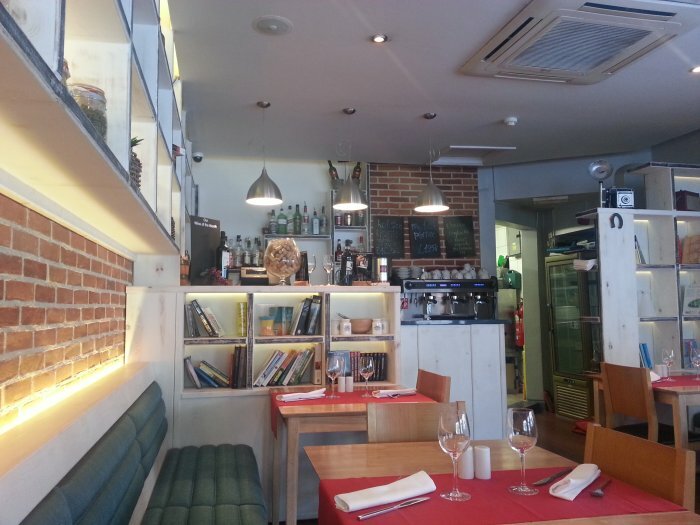 Where better to enjoy a relaxing, peaceful Sunday luncheon than right by the busy Finchley Road? And that was my jovial line of thinking when I acted upon a tweeted recommendation, and settled into Tuttobene for a glass of wine (ended up three) and some Italian nourishment. Now, if I seem a little harsh at points here, don’t let it put you off a visit; there’s a chef here who can most definitely cook, a warm, friendly and polite waitress, and a rather charming interior which manages the right balance of interesting, but uncluttered, with various bits and bobs adorning the walls and shelves in a cheery, random kind of way. My spinach and ricotta ravioli with mushrooms and onion was the highlight; a real bang of savouriness set off nicely by the tomato and cream sauce. The pasta was fresh and and the flavours engaging, even though I wasn’t sure of the presence of any ricotta, at least in any great quantity. I’ll dock a point for a cold plate; I won’t go into one again here on this issue, but it’s something I just cannot understand. Another gripe made itself known via the side salad. Iceberg lettuce has as much right to be on a dinner plate as an ice cube. It is utterly pointless, and remains the only vegetable-based food I would actually choose not to eat. The presentation was artistic and thoughtful, though, and the tomato segments did actually taste of something – though hampered by being straight out of the fridge. Dash of balsamic, cucumber, a bit of onion… As a ‘mixed’ salad? Not bad, but not inspiring. Across the table, my friend (coincidentally somewhat comically named Mark Italy) very much enjoyed a chicken dish (with neat little fine-cut chips) in an apparently excellent dark and devilish sauce; I forget exactly what was in it, as by this time I was getting properly stuck into the wine, an Italian Pinot Noir which was an absolute delight. Tangy and refreshing, with a sour edge – I could have happily self-medicated with two bottles of the stuff with my main and another with dessert. (Checking the menu at http://www.tuttobene.co.uk/menu/, I now note that Mr Italy’s dish was pan fried chicken breast with peppers, onions, olives, mushroom & tomato. Let’s add a point back on for including olives in the sauce). All in all – I’d like to go back. The room is lovely; light and airy (air-con a touch cold though), and the atmosphere would be great with a few more people in there, though I could well do without the naff music. I’d like to see some details smoothed-out; some of the mains were £17+ before sides added, so with the above faults in evidence, one might be a little wary. 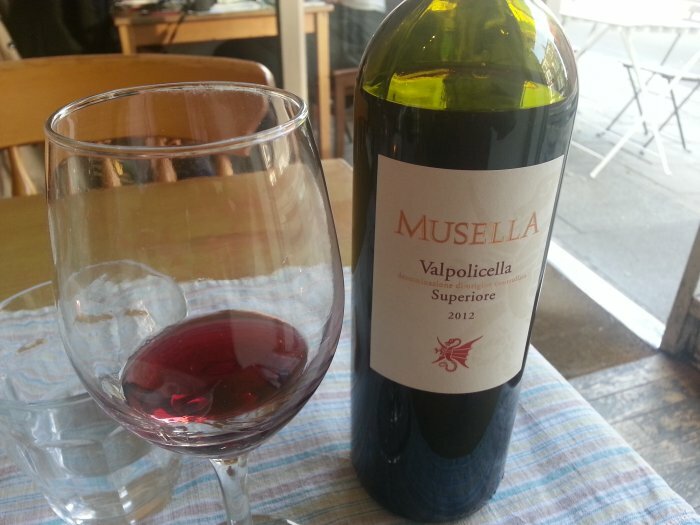 Pizza, pasta, Italian wines…I never tire of such pleasures. I love a good Italian restaurant within walking distance. Only next time, I’m not walking anywhere, I’m getting ******* mashed on that wonderful Pinot Noir and taking a cab home. 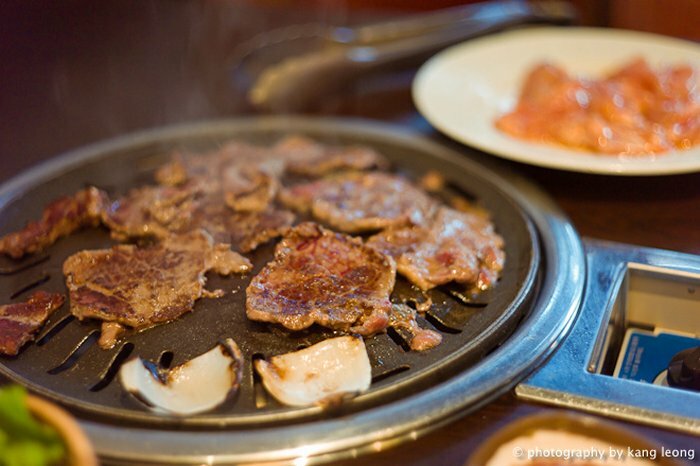 A couple of weeks ago we took 24 people to Seoul on Finchley Road for #whampdinner. 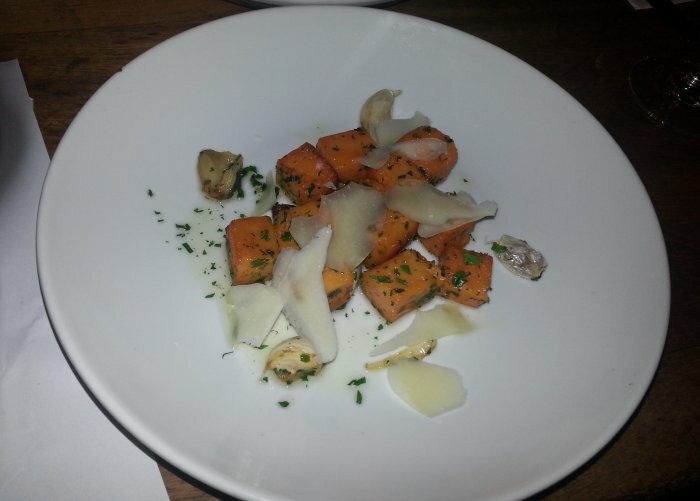 It’s not a restaurant most people were familiar with, so what did we think? Tom: I was interested to see what Seoul was all about, having not eaten Korean for quite some time, and only done the table-top cooking with such cuisine on one previous occasion. In the event, my table bottled-out altogether, with not a single one of us mustering up the courage to try what is clearly their main speciality! Vegetable dumplings with a soy dipping sauce were fine, and got things off to a positive start. However, trying a seafood noodle dish, curious as to how this might vary from a Chinese, or Thai, equivalent, didn’t prove to be the most inspired decision. The thick udon noodles were pleasingly “chewsome”, but tricky to manage with the (very charming) thin steel chopsticks (albeit I am like a drunk stick insect when juggling such utensils). My bowl included one prawn, which being in its shell was even trickier to actually eat, as was the solitary mussel. There was plenty of squid however, which was most definitely on the rubbery side, though not inedible. Not unenjoyable, then, but all a little flat. Other plates such as those where you mix a raw egg into a hot mixture of rice and things, were generally lacking in seasoning. Service was fine, though it proved very taxing for the kitchen to get main dishes out together. Jonathan: Both the other two tables embraced the barbecue concept with gusto and overall it was pretty good. Our waitress really looked after us and made sure everything was cooked properly. We had rice on the side and a small selection of starters including gyoza-type dumplings and the obligatory kimchi. If you fancy something filling and not too expensive then the bimbimbap dishes aren’t going to leave you hungry even if, as Tom suggests, they’re not exciting. 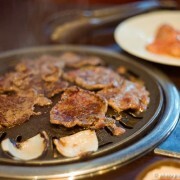 The bulgogi and the barbecue meat in general though is well worth trying – and it’s a fun way to spend the evening with a group of friends. It’s the second time I’ve been to Seoul and I think it’s well worth the trip if you fancy a change from West End Lane. 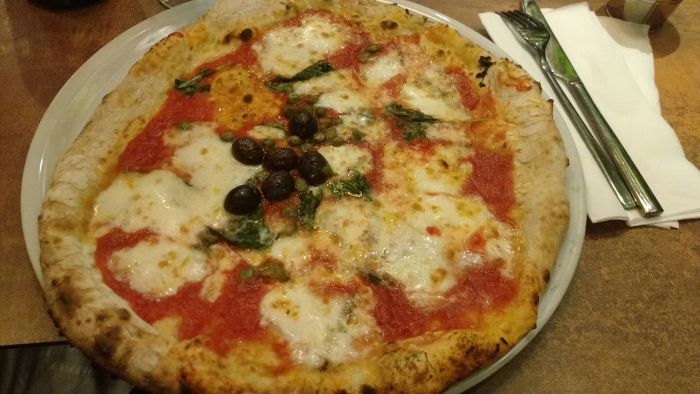 I’d been curious about Luigi’s, on Goldhurst Terrace, near Finchley Road tube station, for a while, so when Jonathan suggested it after I told him saying my brain had (again) malfunctioned and I couldn’t decide where to go for dinner, everything fell nicely into place. After an apparently austere greeting, which made me wonder if I looked a bit of a yob with headphones tangled round my neck and even scruffier attire than usual (in fact, staff were warm, friendly, and reassuringly Italian), some simple white bread and pleasingly garlicky olives appeared (as did a £2 cover charge later, but as the added-on service charge was only 10%, that seemed OK), along with the sort of menu I really appreciate – simple, yet varied enough, without being confusing, and lots of things I wanted to eat, immediately. Opting for the Chianti proved a wise choice; it was excellent, and I could have happily tanned two bottles of the stuff had I not had an important function on the next day (an evening of console gaming with nephew Sebastian, who, it transpires, seems to be following in my footsteps having been a bit ill after enjoying some very high strength Belgian beers). 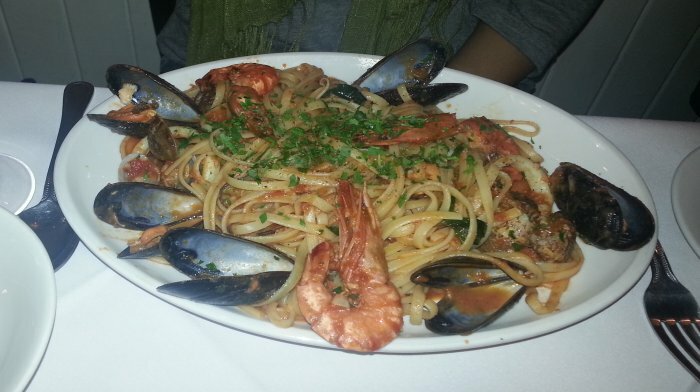 Orders on adjacent tables (seemingly taken by happy locals – a good sign) looked wonderful, with colourful pasta, king-size portions, and plenty of seafood. 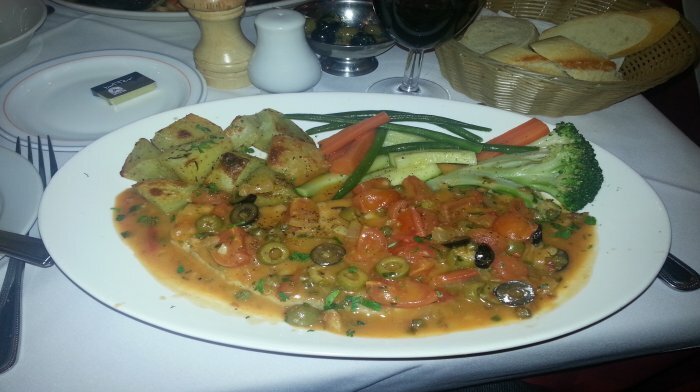 Accordingly, I ordered swordfish livornese, and very nice it was, too. A satisfyingly savoury, orange-red sauce with cherry tomatoes, capers and olives bathed a mighty slab of swordfish, which I didn’t mind being a touch well-done at the edges as it negated the memory of my last experience of this fish, which was horribly undercooked elsewhere in the neighbourhood. Special mention for vegetables, which were presented, and clearly cooked, with care. Neatly cut courgettes, carrot batons green beans and broccoli were right on the button of al-dente, and the little roast potatoes, whilst not super-crispy, were lovely all the same. Seafood linguine was also a success, with a sauce just coating the pasta in the Italian way, and a touch of sweetness and spice, perhaps from nutmeg (says he, with a palate sensitivity level which can barely differentiate a lemon from a lamb chop – especially after a few reds). 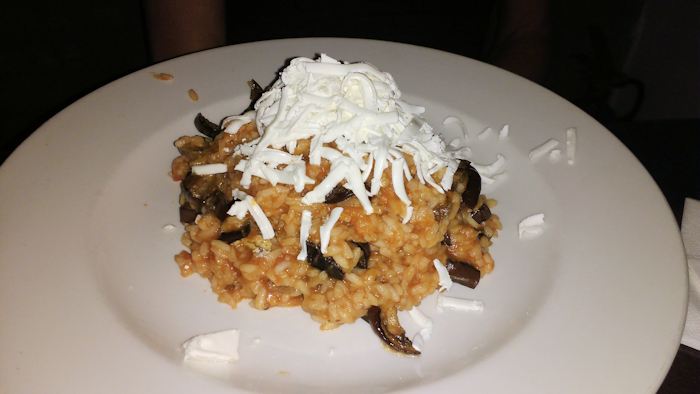 Luigi’s food was wholesome, traditional, and (cliché alert) rustic. It made me smile in a happily stupid way. To sum up more succinctly; I’m planning on going back soon. And not just for the Chianti – though that will likely play a significant part in proceedings too. Synopsis? I sense a really fine restaurant, but perhaps I didn’t see the very best of it on this occasion – not that it wasn’t enjoyable. 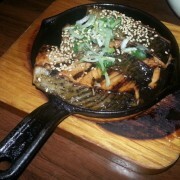 My salmon teriyaki was delightful. How pleasing it is when salmon is just-done, pink in the middle, delicate and flavoursome. I was happy with the portion size of my mixed, crunchy, stir-fried vegetables, though the soy sauce had a slight bitter edge of which I wasn’t sure was deliberate? Of extras, I thought I was ordering a side of cooked greens, but in fact this was a salad – more obvious on the website menu where it is described as such. This was a large portion by default, which made for a rather pricey side dish, but with the nice touch of warmed cherry tomatoes, all was gobbled up. 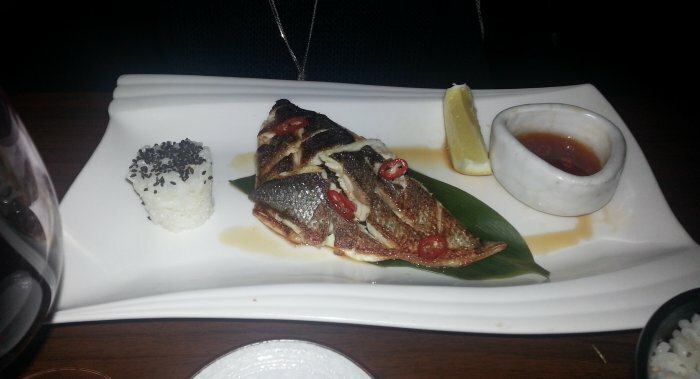 Bream was declared all gone a few minutes after ordering, but sea bass replaced this in a subtle dish with red chilli, a citrus dressing and soy sauce, and which like everything else was elegantly presented. An Argentinian Shiraz turned out to be a Shiraz / Malbec blend, and whilst having a decent finish and stiff tannins was perhaps a touch light, surprisingly. Not that I was making any effort to match grape and grub anyway; sometimes (OK, often) I’ll go for a heavy red when something else would be far more apt, I’m such a simpleton when gasping for a drink. Glancing round, the various sashimi plates looked really impressive, and I’d certainly like to try more in general at Yuzu. It’s clearly popular with locals, and the staff were warm and enthusiastic, but in a nicely reserved way. Please rest assured that my worrying phase of sharing desserts has passed for now; though in this instance I skipped pudding anyway. Actually, some might say that’s even more worrying! Guglee was bang on form the other night when I needed some late-night sustenance after working long hours and not having had even a droplet of wine for several days (do not adjust your sets)..
Prawn kadai was again a top dish, but the one to note from this visit was the Coastal Goa Fish Curry; described as “a popular, mildly-spiced fish curry cooked with kokum, fresh coconut and chef’s secret herbs”. A tantalising bowl of goodness; I thought the spicing had plenty of heat to it, and the flavours were typical of Guglee – fulsome, layered and balanced. Not sure if my wine-battered palate is showing signs of wear and tear, but I was convinced there were peanuts in the sauce; apparently not, though plenty of coconut. We were grateful to be given a taster of a second Indian Shiraz from the same Sula Vineyards as the usual one; this isn’t on the menu yet but proved another excellent and intriguing wine. 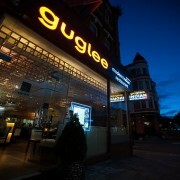 Guglee remains reliably good, consistently popular, and always with a cheerful, vibrant atmosphere. In fact, bring on the rain and snow so I have even more excuse to be hit for six by such fiery, tongue-tasering food. A bit of a mixed bag at The Alliance on Mill Lane the other day. Let me explain. Bread and olives were definitely of the ‘value’ variety; a warmed baguette with no butter or oil, with green olives of the brine / jar type; not a crime – but at £3, one might expect posher ones? 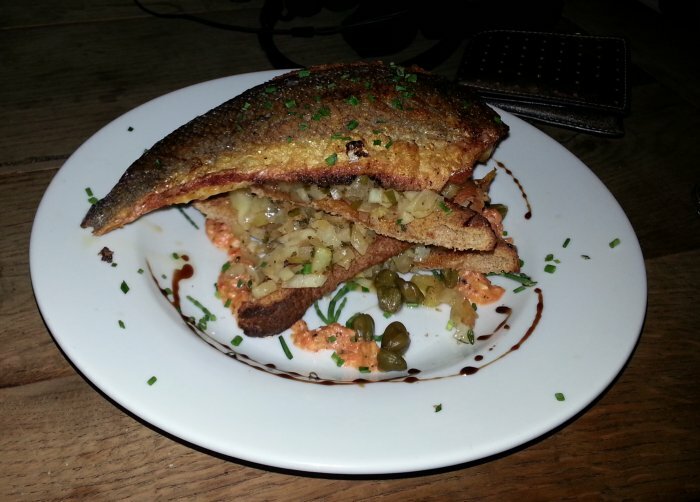 My main was a puzzling dish that was almost right, but just fell short: a generous sea bass fillet with a pleasingly crispy skin, placed on top of a tower of “crostini”, which was actually made up of an amusing series of toasted, sliced brown bread triangles! I’m not convinced this was chef’s original intention when the concept was conceived, but at least the toasts were nicely crisped. A caper vinaigrette and samphire worked well, though perhaps the orange-coloured sauce and dash of balsamic weren’t really needed; the chopped fennel was a sound idea but a touch underdone for my tastes. Overall, good elements, just a little over-complicated and confused. Fries materialised rather than chips, because chef had “run out of them”, but with plenty of ketchup, that wasn’t too much of a problem. Madame Fusspot was most definitely not pleased to find her risotto undercooked. This was a pity; with Parmesan, chopped peppers and char-grilled courgette neatly placed atop, the flavours were bang-on, but to send it out without finishing the cooking properly seemed altogether strange, though it has to be said this seems to be one of the most common, if inexplicable, eating-out errors. All in all I just wonder if The Alliance – a welcoming, friendly pub that’s always relaxed and mellow – is caught slightly between trying to do pub grub and something a little more elevated, without quite finding the right balance yet. Or perhaps I’ve just been a little unlucky on recent visits? Still, there’s leather sofas, live sport (on TV, not actually going on in the pub – unless you count Wine Olympics) – and a fulsome breakfast menu too. Eggs Florentine and coffee while watching the downhill would have been fab. Alternatively, a traditional, hangover-busting fry-up with perhaps a more conservative use for those funny triangles of toast! I took an overdue trip to The Arches on Fairhazel Gardens the other night; always such an interesting venue to enjoy some good food and wine, with elements of mystery and intrigue to go with the fun and craziness of the place. 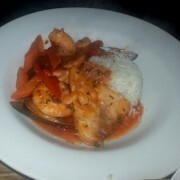 As ever, a waitress directed our gaze to the mobile specials board, and I instantly locked onto the fisherman’s stew. There was a slight error when ordering; enquiring as to whether the stew came with anything, I was told no, and hence ordered chips, but in fact a large side of rice accompanied the dish (and indeed worked very well with it). 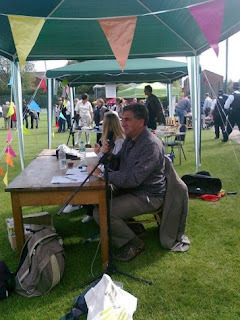 Even by my gluttonous standards, powering through all that lot would have been a little too much – though I did my best! 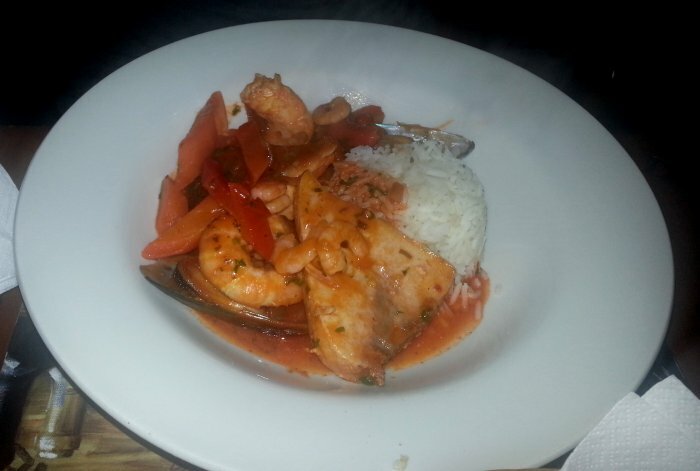 The stew was wonderful; large, proud, glowing prawns (perhaps just a fraction well-cooked), swordfish, and mussels, nicely accompanied by some al-dente, attractively sliced carrots, and bell peppers which had been grilled or baked first to get some charring on the skin. It wasn’t a particularly wet stew; more a seafood and sauce affair, but the latter was intense and well-seasoned, and of a most satisfying orange-red colour. A simple, but soulful meal, great for people like me always complaining about the weather. Shock of the day was my remarkable decision to share a dessert for the first time ever… who says romance is dead?! In fact, I…oh hang on, incoming text message..
Oh well – back to my window seat with a newspaper in La Brocca! Interesting evening on Saturday at Mamako, the new pan-Asian place that’s replaced Spiga on Broadhurst Gardens. It was the venture’s opening night and what followed was a little chaotic! Must be said right away, the food was certainly good and in parts excellent. Standouts included the Malaysian curry puffs – a chicken parcel thing with a quite exquisite pastry – some veggie gyozas with a delightful, soy-based dipping sauce, a Nyonya chicken curry and Nasi Lemak. My seafood noodle dish was nice, but not special, with everything cooked just a little too long in the wok; very soft noodles, slightly rubbery prawns and squid rings. The menu definitely veers towards Malaysia and Thailand, but there are a few Korean and Japanese items on the menu too. The team seemed to have been thrown by a large party of a dozen people – one or two were friends of the owners, but they hadn’t realised such a big group was coming and the kitchen never recovered. For those arriving just afterwards, orders took an extraordinarily long time, and plates arrived in a disjointed fashion. Inevitably, there were a couple of polite walk-outs, and – as the last table left – we were given our meal on the house which was a nice gesture. The waitress was endlessly polite and apologetic, and both the chef (who is clearly skilled and displays warmth and enthusiasm), and the manager, took time to chat with us at the end to explain their difficulties. We just felt that more communication as to what was going on earlier in the evening, and perhaps some nibbles etc. while waiting, would have gone down well. 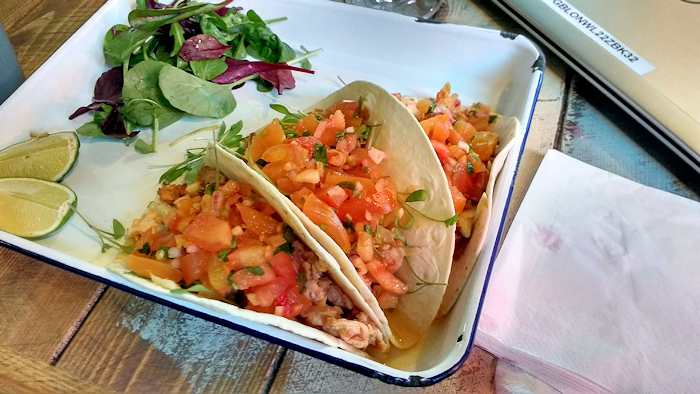 All that said, the menu is enticing and there’s lots to intrigue the diner – get along there, but give them a chance while they find their feet. I’m sure we’ll be back to do a proper review before long. Now, none of that ‘dry January’ rubbish for me, thanks very much; get some Port down you and keep warm the right way! 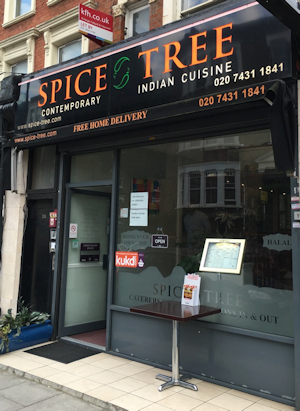 In urgent need of a really fiery bite to eat the other evening, I decided to try out Spice Tree on Mill Lane for the first time since their refurb and change of name (from Babur Empire). 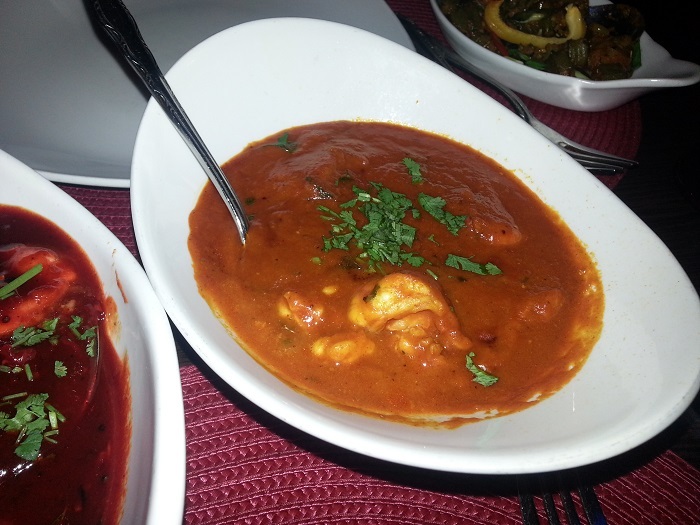 Whilst the new menu has more variety in regional dishes (and is certainly very appetising), it was one of the old classics I was after; namely a cork-poppingly good king prawn jalfrezi. I’d quite enjoyed this in the past from Babur, and was curious to see if anything had changed. Quick verdict – enjoyable, not bad, not amazing. The prawns were a little rubbery, which is a fairly regular occurrence with prawn curries in general I find (even my sacred Tiffin Tin were a little off-form with prawns last time out, unusually) but there were enough of them, which is important of course. 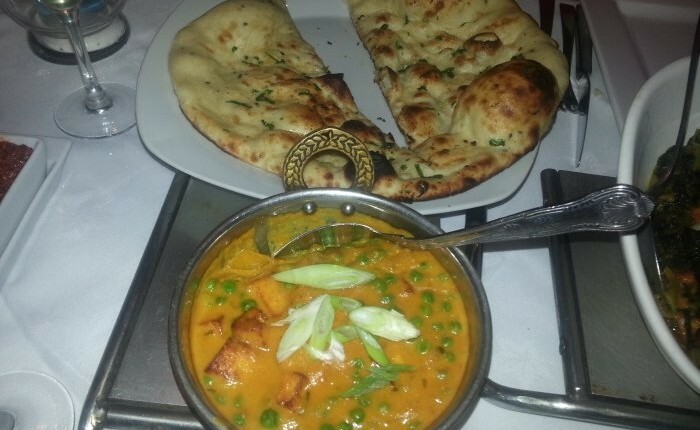 I don’t understand “quality not quantity” when having a curry – I want both! 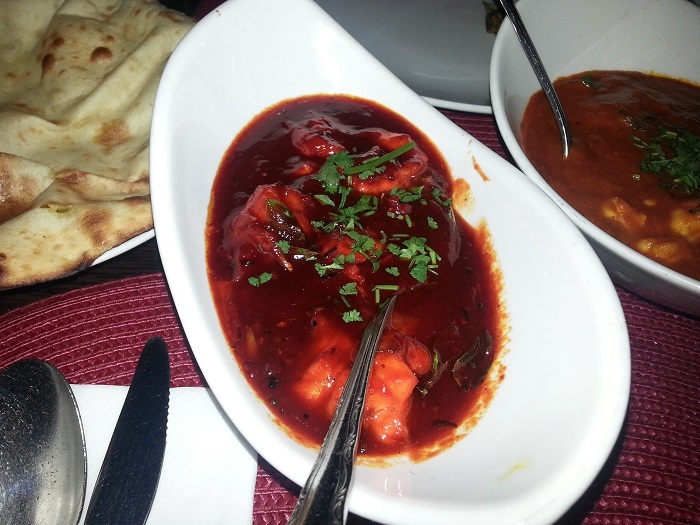 The sauce was very similar to how I remembered it; ‘traditional’ – very buttery, and nicely tangy. Onions finely chopped, though personally for a dish like this, or a Rogan Josh or Korai, I like big chunks of tomato, onion and things; it makes it more interesting. There was enough heat from the green chillies, but the green bell peppers were absent altogether; annoying. A side dish of veg curry was decent, of good flavour and again very buttery, though with a slightly odd limitation in vegetable varieties, with an emphasis on green beans. Make of that what you will! Paratha was fine, a big disc of enjoyment, though had lost some life in its short journey to Tom Towers. Overall then, I enjoyed my hot and spicy dinner, but with the main dish costing similar to what I’d pay at the marvellous Tiffin Tin, I’d perhaps find it hard not to go with the latter next time, as I usually do. That said, I’d be interested to revisit some other old favourites, and have a meal in the restaurant soon where perhaps I’ll be somewhat more adventurous. Ahhh…. 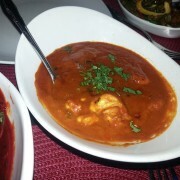 a soul-warming curry on a cold winter night. What is it with chillies and things? So uplifting. 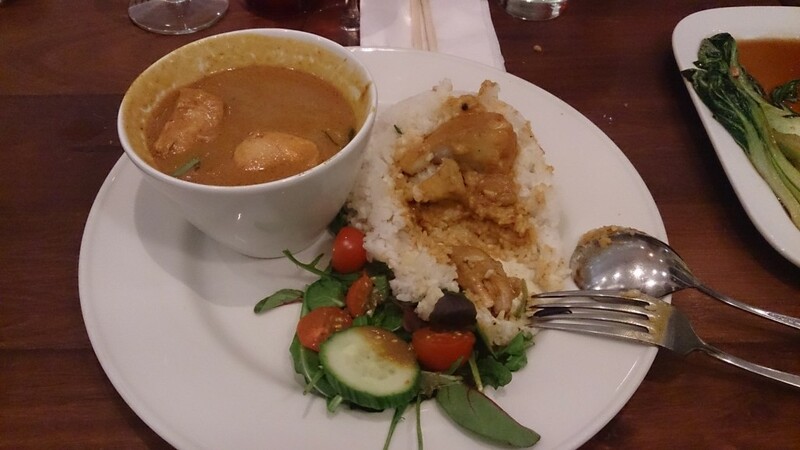 Actually, I’ll happily eat a curry any day of the year, for any meal. Proper food, for all seasons – including this festive one. Happy dining! 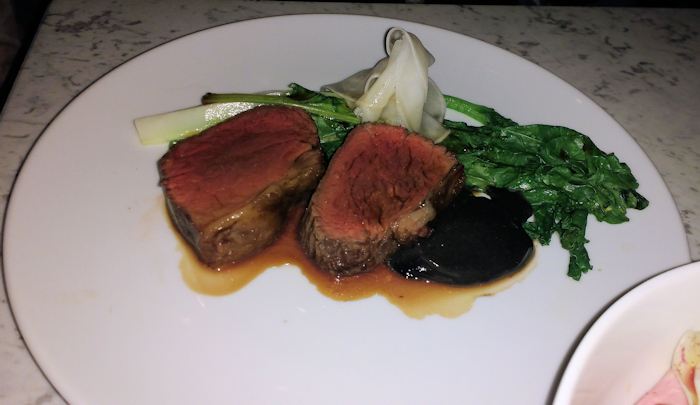 I had dinner and wine with @WhampChef in The Black Lion, West End Lane on a recent Sunday evening; I’d not had grub there for a little while and had a good reason for not cooking anything at home: laziness. 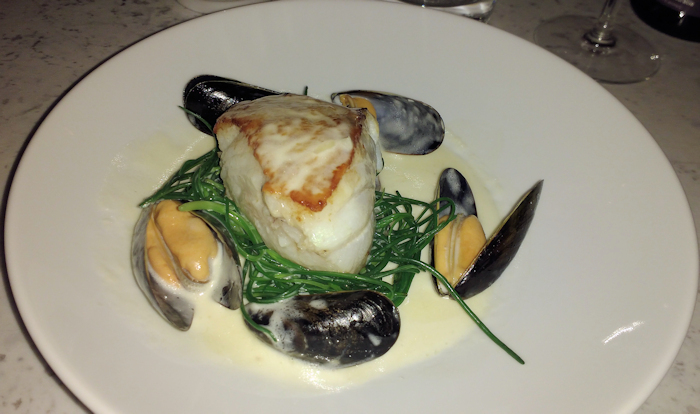 Having been blown away by the brilliant fish and chips last time, I zoned-in on sea bass on a bed of wilted kale, with roasted salsify and a sorrel & mussel cream. I say ‘zoned-in’, but in reality I take ludicrously long choosing, though on this occasion a bottle of very good Pinot Grigio helped things along. 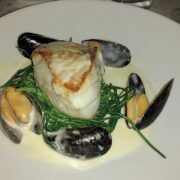 Excellent sea bass; all the things you want – well-seasoned, perfectly cooked, with a crisp skin. And, just as importantly, a decent sized fillet it was too. 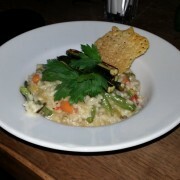 Along with the cheerful, fresh-tasting chips, the dish proved a sizeable portion, illustrating that high-level pub food doesn’t have to be lightweight. The mussel cream seemed more like a hollandaise to me; but perhaps my judgement was tainted by then, as we’d pretty much merrily tanned our second bottle (a pleasing Argentine Cab Sav). Credit too for the Lion for plenty of kale, which I love. 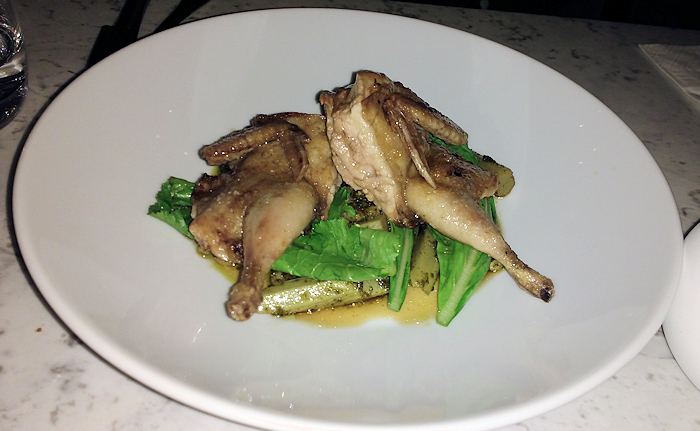 Wasn’t quite as convinced by the salsify; the little slithers perhaps a touch underdone, though all were consumed. @Whampchef ordered lamb, then confusion arose when beef was delivered; we sensed the waitress wasn’t sure herself, having brought along both horseradish and mint sauces! Still – no harm done, and the beef was swiftly devoured. As with its sister pub, The North London Tavern, the Black Lion does a roaring trade (ha ha!) even on a Sunday, which makes it an uplifting location to round out a weekend. 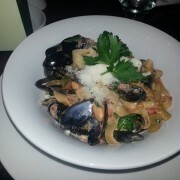 The wine list is splendid, the atmosphere lively, and it’s just a great place to have within walking distance of home. Right, I’ve run out of stupid one-liners, so I’ll disappear now and pour myself another one of this excellent Viognier. 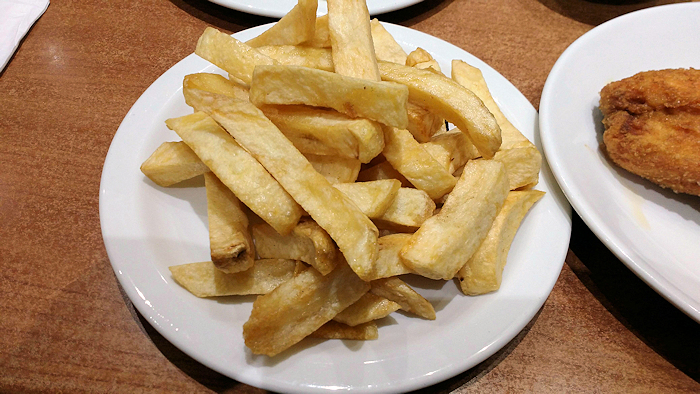 You can’t get too much of a good thing – especially when served with plenty of piping hot chips on a cold Winter evening.. Enjoy your Christmas shopping, everyone.. Mine takes place, glass in hand, on Amazon High Street! Glancing at the board, the special of asparagus ravioli with cream & mushroom sauce sounded nice (and in hindsight I perhaps should have given this a go), but in the end I went for cod fish cakes with coriander and spring onions, served with salad and sweet chilli sauce. These arrived via a slightly confused process when ordering chips. “French fries?” asked the waitress a couple of times… “No – chips – like what those two are eating” I explained, pointing impatiently at a middle-aged couple who looked like they should be in church, not a Kilburn restaurant. There were also a few nervous moments when ordering repeated glasses of Pinotage; with it being the priciest wine by the glass, I wanted a warm glow of confidence that this was what would arrive…but I tempered my anxiety by reminding myself that whilst I can barely order a baguette in France, here’s this keen, friendly young lady, about 18, who’s ventured over from Eastern Europe, and grabbed a job in a town which might seem a little intimidating until one knows better… A case of “it is what it is” to some degree, though staff training is of course key in any eatery. So, decent fish cakes; nice texture and neat presentation. A bit of a harsh background note, possibly the coriander clashing with something, but along with the decent chips and tomato ketchup I was happy enough. Broccoli a touch over, green beans fine, though I do wish a slab of butter or dash of oil would be standard when ordering veg, anywhere on the planet. 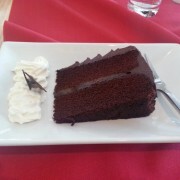 Chocolate fudge cake for dessert (wow, I’m so adventurous!) – and full marks to the waitress here for grasping the seriousness of the situation when I said, very firmly, “NOT TO BE HEATED UP!” – now that does wind me up, that does. It’s a cake – it’s already been cooked – once is enough! Back in business then? Well, yes, though some might feel it’s lost a little of its ramshackle charm in its refit – but it’s not vastly different. I note it’s owned by the Nona group now, and their pizza joints have received some good feedback recently, too. All in all, it’s an evolution, but let’s hope there’s no revolution. Small & Beautiful is in its own little world, and long may that continue. 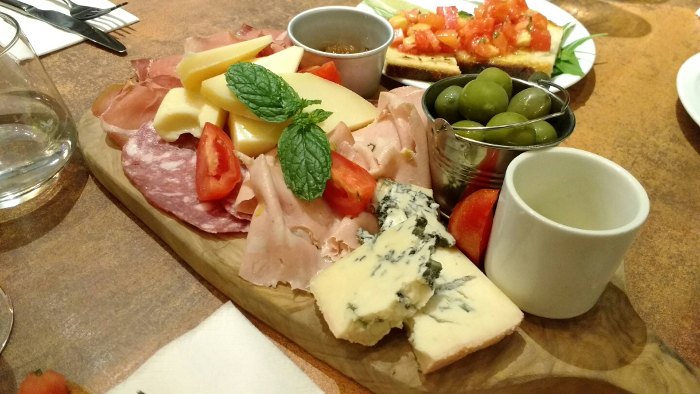 After several free proseccos kindly bestowed on us by The Cricketers at Kew Green (re-opening bash – very nice pub), our unruly trio had worked up a healthy appetite and headed back to NW6 for some well-deserved pasta in Spiga. Despite gnocchi with Gorgonzola and wild mushrooms being on the menu (I’m getting so hungry just typing this), I decided on the more subtle, ravioli dish; a ricotta and spinach combination, something that always works, with nutmeg, in a sage butter. Absolutely delightful! I accompanied this with a rocket and shaved Parmesan salad – I know I order this frequently, but again, it’s a tried and tested union of flavours that just seems to go so well with so many dishes, especially when the Parmesan is good. 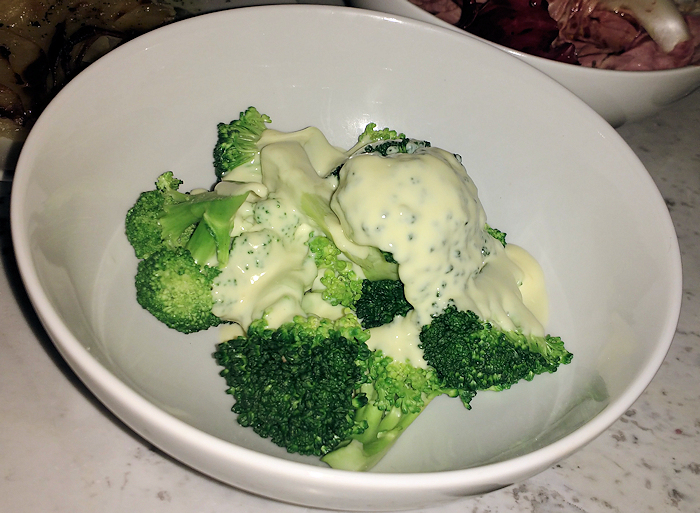 I also ordered some broccoli; a generous portion, respectfully cooked. I love green veg in general, I find the more you eat, the more your body kind of asks for more, perhaps in my case to replenish a few nutrients lost to excessive wine consumption. 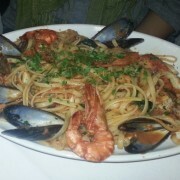 When you eat out and have pasta, you really want to be impressed, and every time I have pasta in Spiga, it’s delicious. A bit silly of me to get carried away drinking brandy to finish the evening though; woke up gasping for water and needing pies and things on the way to work. I’ll never learn! 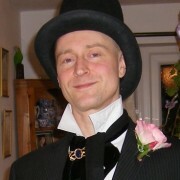 A jolly good time was had by all in the Black Lion in Kilburn, for a friend’s birthday last week. It’s a pub I find particularly welcoming and relaxing; spacious, combined with many leather sofas to chill out on, and the gorgeous decor and opulent ceiling-work. Sticking with a sauvignon blanc all evening to avoid a school-night hangover (didn’t work, but the wine was lovely), I launched into a haddock and chips, which whilst not matching the grandness of The (West Hampstead) Black Lion’s version in terms of big, crispy batter, this was still pretty good. Special mention goes to the most flavoursome mushy peas I’ve had for ages – really nice to see extra attention to such a simple thing. My watercress salad came with shaved parmesan, and we all enjoyed the wonderful olives as well. (I do love good quality olives; was delighted to stumble upon pick & mix options in the grocery at the top of the KHR recently, opposite the now-closed Angeles restaurant – another successful, booze-fuelled, midnight Kilburn shopping jaunt). A word about the very fine chips, too. I like that one can get different variants of chips these days; who doesn’t enjoy the marvellous textures of triple-cooked ones, for example? But the Black Lion’s have their own character too, being – for want of a better word – highly potatoey, with a more subtle outer texture to the skin rather than all-out crispness, and splendid colour. Really, with some bread and tomato ketchup, a dish on their own. Other plates happily demolished included asparagus and blue cheese risotto, burgers, chargrilled sirloin with chips, pickled schimichi mushrooms and garlic butter, and a very impressive-looking pan-fried duck breast with sautéed truffle potatoes, wilted baby spinach, spicy mango and chilli tartare, plus summer berry sauce! The staff looked after us, bringing out the birthday cake as planned, and just in time, too – I’d forgotten and was about to order dessert.